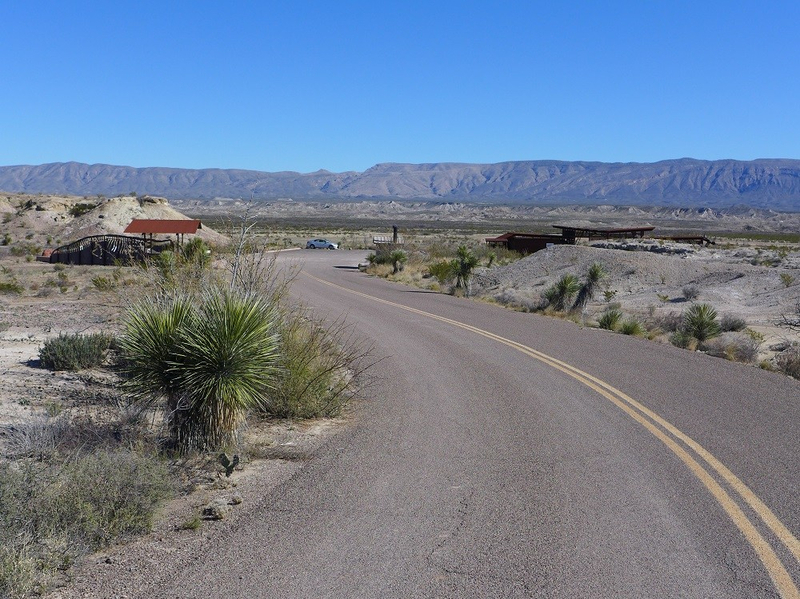 In 45 years of visiting the park I had only stepped north or west of the park road (US 385/TX 118) twice. 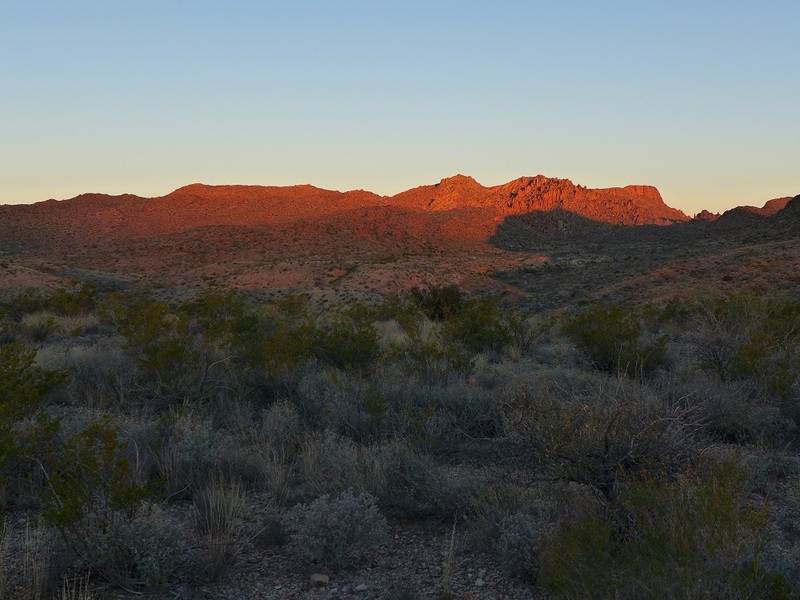 On the first day of my very first visit in 1973 we had just turned onto the Grapevine Hills road heading towards a campsite for the night before starting the Outer Mountain Loop the next day. The muffler dropped off the car so we turned around and limped up to the Basin, which still had a gas station/garage at the time, to do some makeshift repairs and spent the night in the Basin instead. 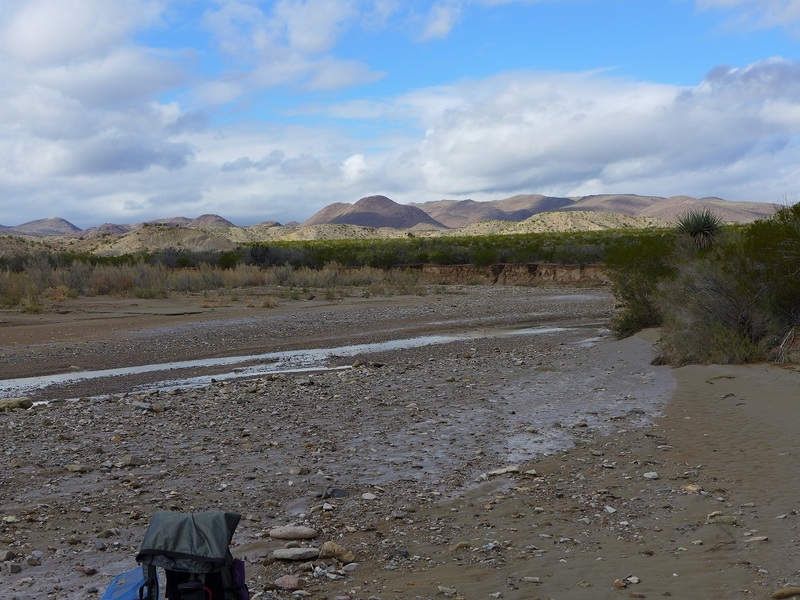 My second time was 43 years later when Robert and I stayed at the Croton Springs campsite before heading back to San Antonio after completing our Southwest Sierra Quemada Ramble. That’s it, but it has always held some mystery to me as a little explored section of the park. 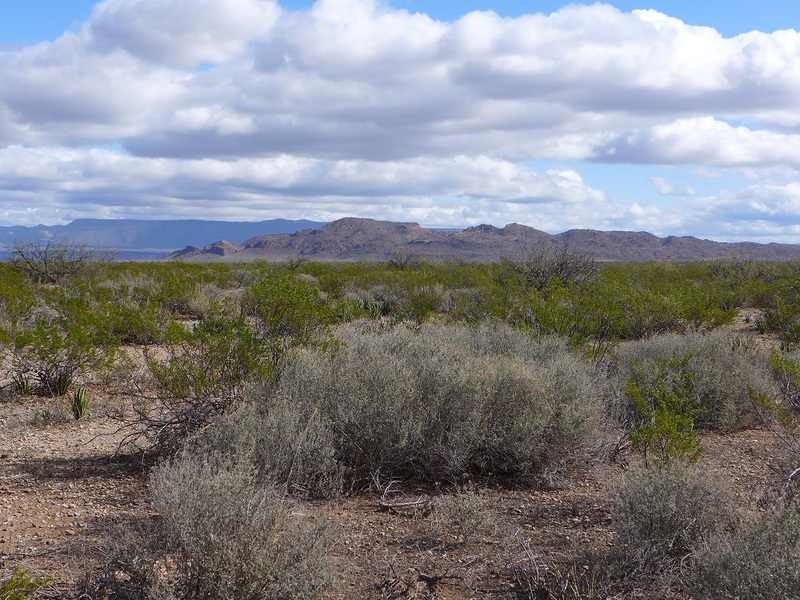 There are really two parts of this large northwest swath of the park, an elongated area south of the Rosillos Mountains and ranch which I would walk around on this trip and the northern area of somewhat newly added land (acquired in 1987, opened to the public about 1995) of the Harte Ranch and northern Rosillos Mountains which I am saving for a future trip. 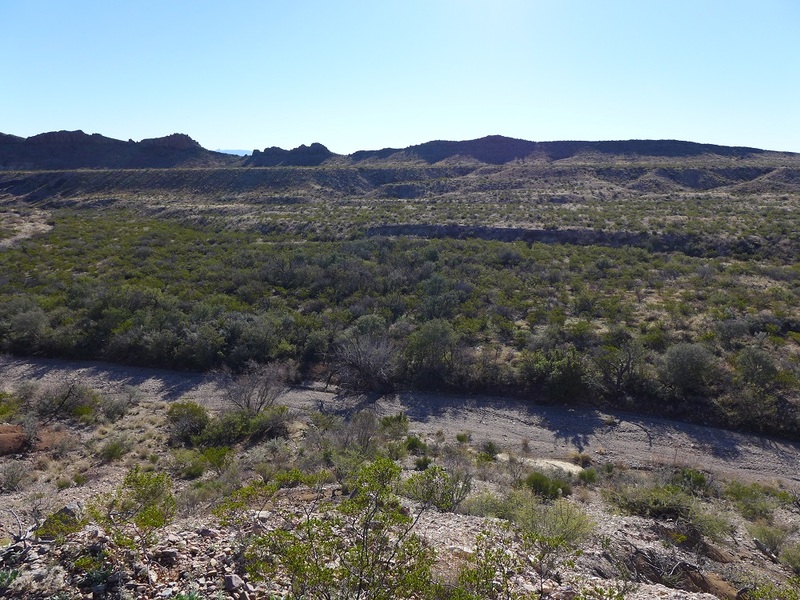 As usual there was great inspiration from trip reports on Big Bend Chat that gave me ideas and info. 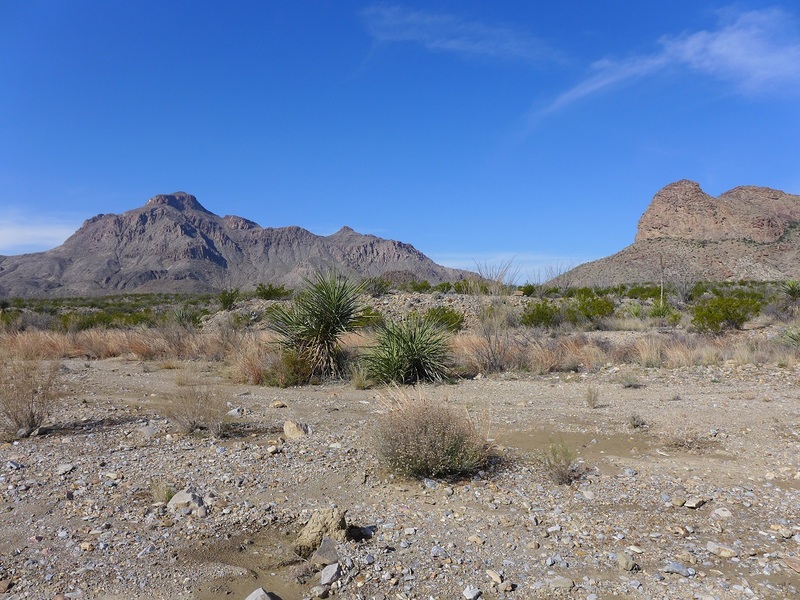 The idea of walking north of the mountains and hills and then returning via a southern route that would take in most of the springs, major washes and sites was appealing. The views would be totally different on both sides as well. Here is the Caltopo map for reference. For the first time ever I would go solo. All of my possible hiking partners were unable to join me due to many, many conflicts and I could have postponed for a year but didn’t really want to. Betsy does not want me to go solo but with the fairly easy wash walking and terrain and the many near road bailout points I convinced her to let me go. To further insure her confidence I rented a satellite phone from Roadpost which worked perfectly even though it added some weight (9 oz.) to the pack and extra cost. Of course water availability is always the hard planning detail especially for areas of the park where few people go. Fortunately it has been an above average year for rainfall in the park which made me feel more confident in critical water sources, especially those north of the hills. 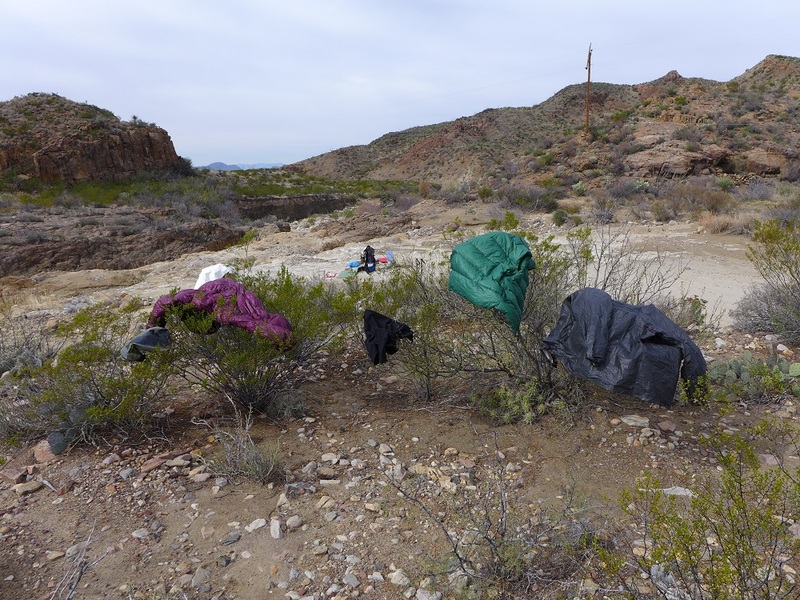 I planned on picking up some along Tornillo creek the first day, then hopefully at either Dripping spring or Painted Hills spring the second day that would carry me all the way to Dike Tinaja spring the end of the third day. From there a fairly easy walk to water at Slickrock canyon on the fourth day. From there I would carry enough water to get to a water cache on Paint Gap road early on the sixth day. Water from the cache would get me all the way back to the car. I would also leave enough water in the cache just in case Dripping or Paint Hills springs were dry, I could make a detour to pick it up if needed. It turned out that the day before I started the park had 1.2-1.7 inches of rain and there was water everywhere. 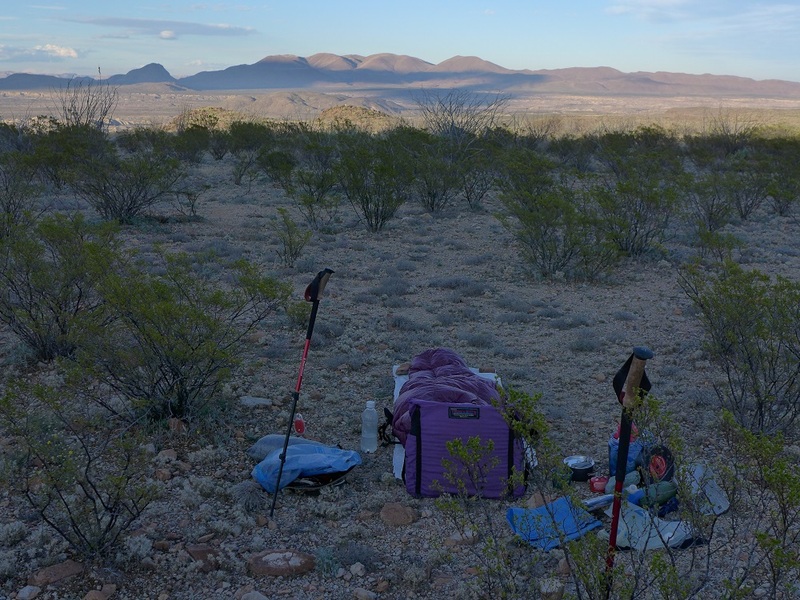 To help with reducing pack weight early in the trip with fairly large water carries I would split the food load in half and leave it in another cache I would pick up the fourth morning. 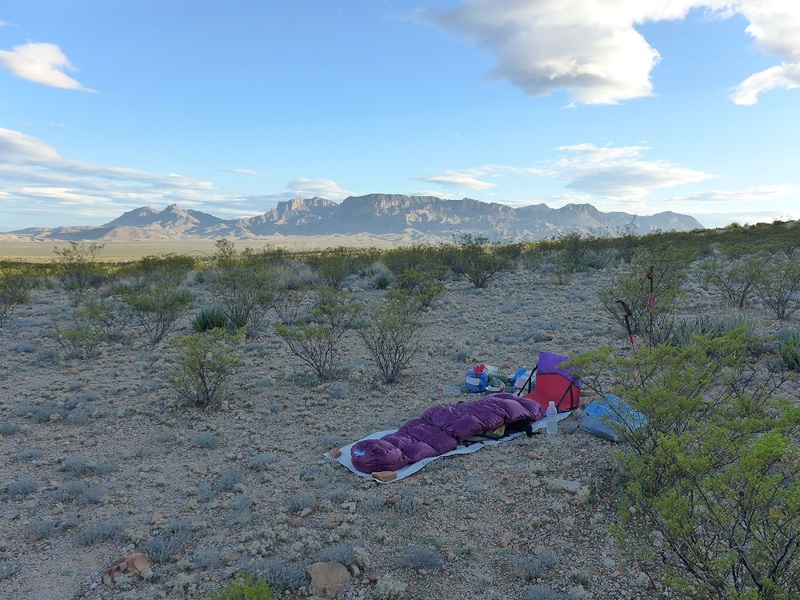 With this approach my total pack weight never exceeded 28 pounds, even with a base weight of 13.5# including the satellite phone, tarp and raincoat, most of which I usually don’t have to carry. I flew into San Antonio late morning just as the big winter storm “Diego” moved into the area (I still hate this naming of winter storms). I first stopped for lunch at De Wese’s Tip Top Café for maybe the best chicken fried steak I have ever had. Quick stops at REI for a gas canister and HEB for a few road snacks and then I drove west on I-10. Constant rain until Fort Stockton then heavy fog on the way to Marathon but by the time I got to the Marathon Motel at 6:00 it seemed to be lifting. Good BBQ at the Brick Vault BBQ and Brewery then back to the room to finish packing. Up early and at the Oasis Café for a great migas breakfast, the last real food for seven days. I made it to Panther Junction just after they opened and had to wait just a bit while a group was in front of me getting a river permit. The ranger was very slow and methodical. He said he needed to check the capacity of the zones I wanted to camp in, I said “no one goes there, I am sure it is not a problem” he looked up and concurred. By the way I got my geezer Senior Lifetime Pass which covered the now $30 entrance fee and made the backcountry permit only $6. Filled water bottles and at 10:00 I was off to set my caches. It was still actually spitting a bit of rain and the fog between PJ and Paint Gap was really thick. 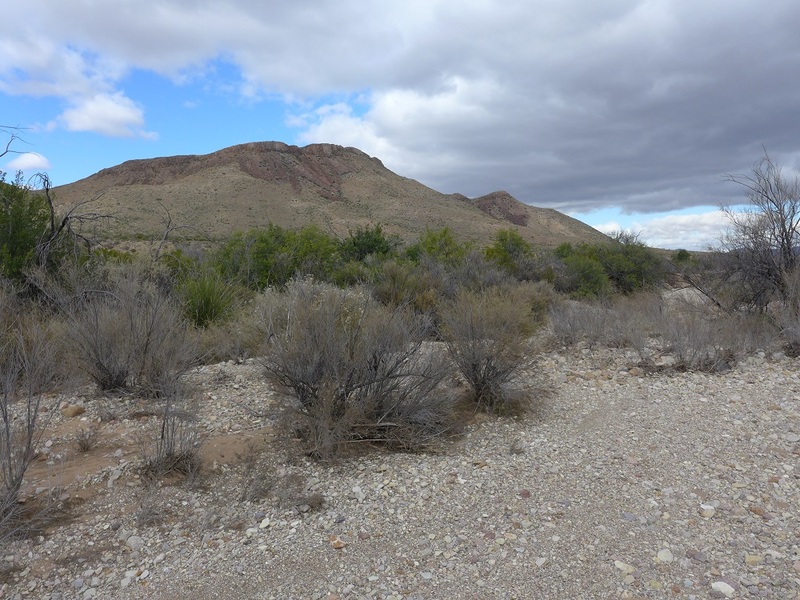 I went to set the food cache near Burro Mesa first to give the weather some time to lift. This was a bit harder than I had anticipated as I had to drop down into the wash and everything was wet and sticky in the clay soils. Back over to Paint Gap road and I dropped my large bear canister filled with 11 liters of water just before the Paint Gap 2 and 3 campsites and a huge puddle in the road, the weather was trying to clear. I will be walking in from that direction in 6 days. On up to the Fossil Bone exhibit where I was leaving the car. Last bit of packing and I was off at 12:30. 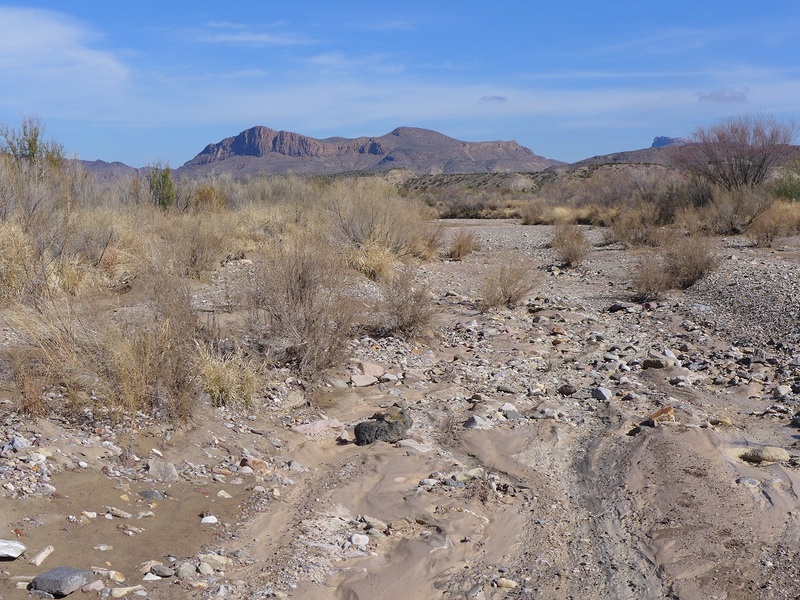 As I dropped into Tornillo creek this is what I was faced with. 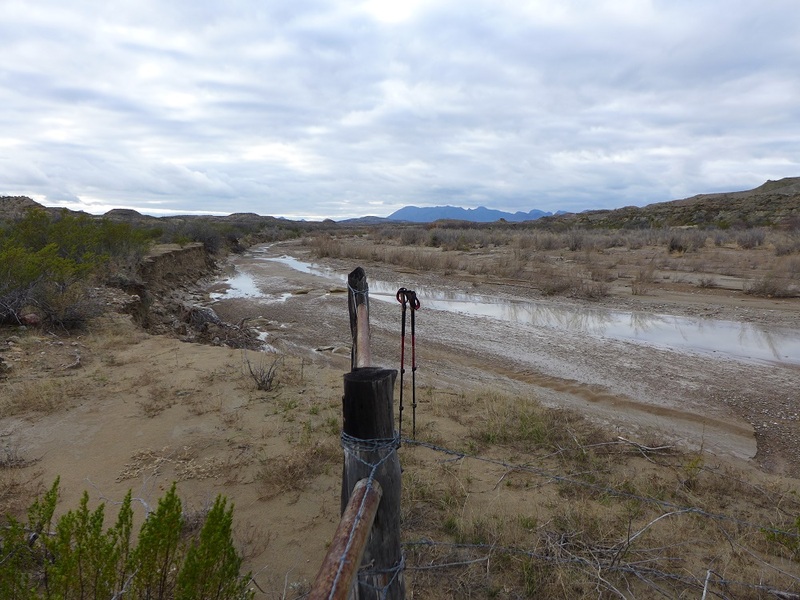 A small enough stream that I could easily find places to cross without getting wet, looking at the Dead Horse mountains. 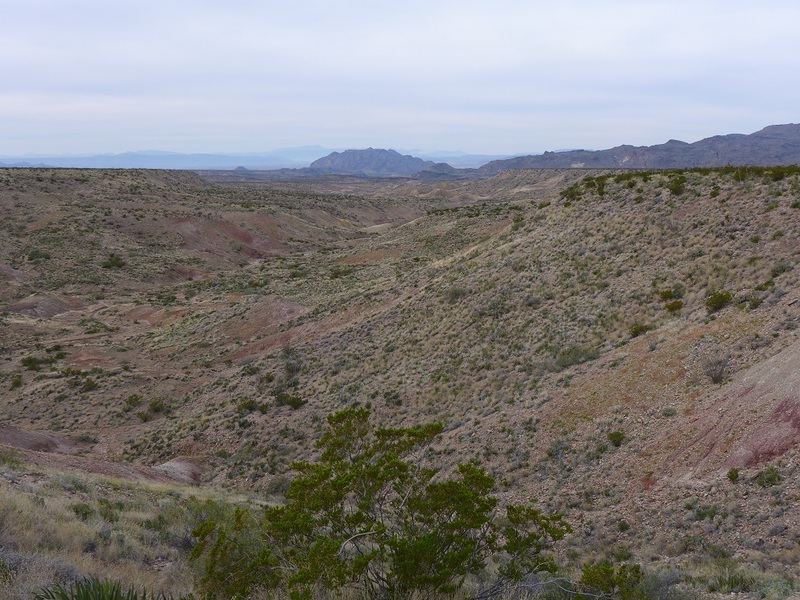 and of Grapevine Hills that I would be coming back through in six days. 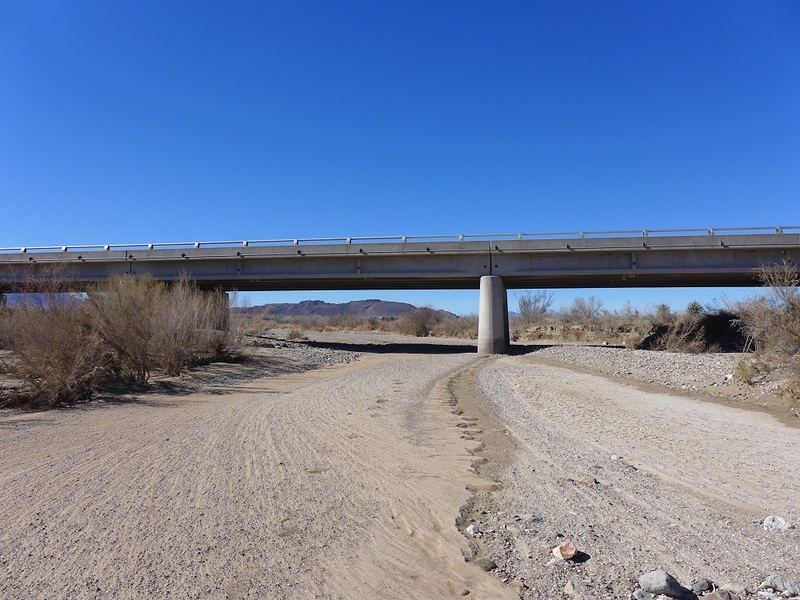 I walked beside water the entire time I was in Tornillo creek. I crossed under this power line at 6 miles and I would end up crossing under a power line 5 times on this trip. As I got near the rockier sections I came across this boulder with what looks like mortar holes and metates but could be just where inclusions washed out too. I stopped at where the creek falls over ledges and picked up a few more liters of cloudy water to get me to my next water tomorrow morning. There is a short stretch where the creek moves out of the park and then back in, this is the park fence as it heads back in. At 5:00 just short of 9 miles for the day I stopped at the junction with the wash that runs down the east side of Paint Gap Hills. 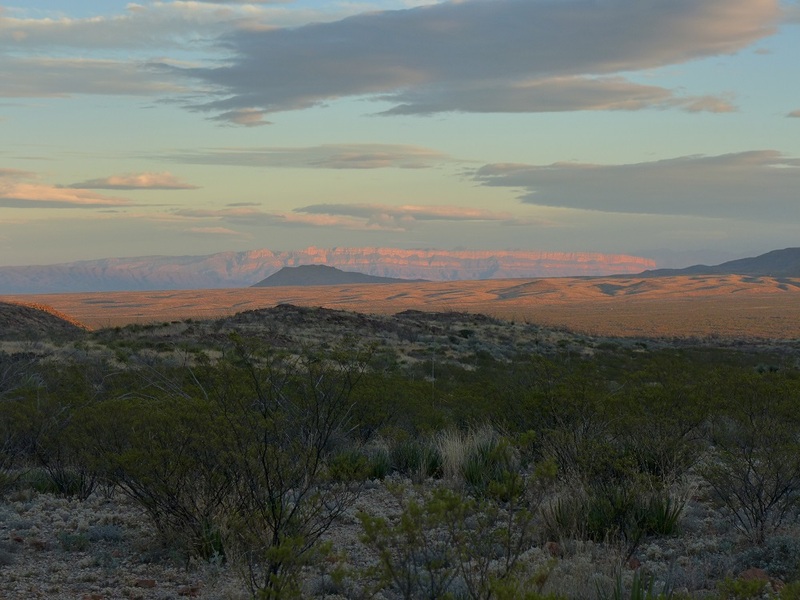 South to the Chisos and west to the setting sun in the now mostly clear skies. I fell asleep to the sound of trickling water, never figured that would happen on this trip. 36 degrees the low and biblical dew which I knew would be a problem after the big rain, everything was soaked. 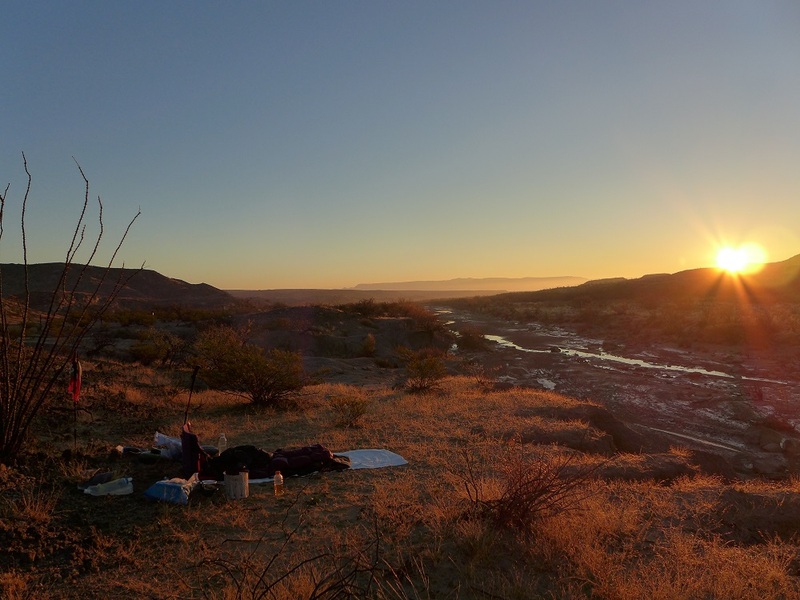 Fortunately the sun hits camp at 7:45 so I enjoyed soaking up the warmth and the view while having breakfast. I didn’t get walking until 10:00 while I took the time to dry out the sleeping bag and other stuff. One of the great things about being the first up washes after a rain is looking for all the new tracks in the soft ground. 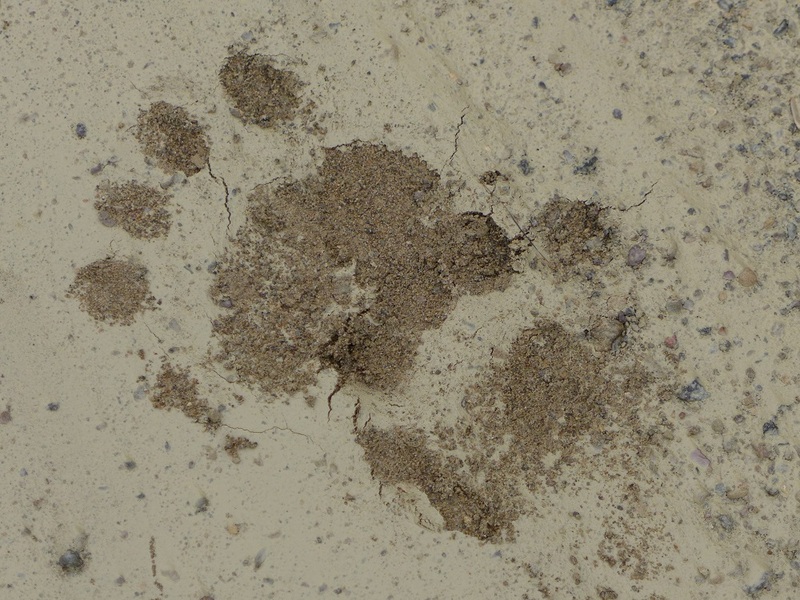 Lots of bobcat tracks along with deer, javelina and coyote, no human tracks but mine. 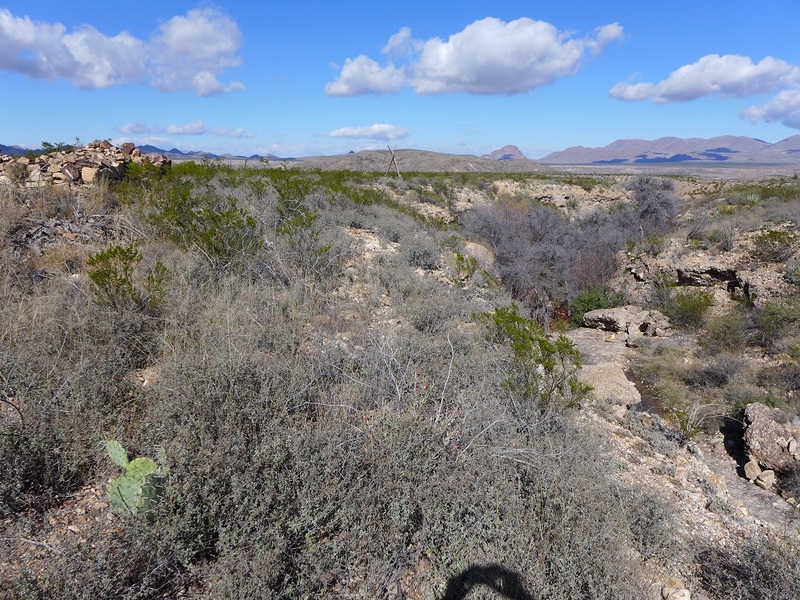 I made my way over to Dripping spring by noon after nearly 6 miles. I came in east of it so had to work my way over to it but I could see the corral for some distance. A grand view of the Christmas mountains with Little Christmas on the left. 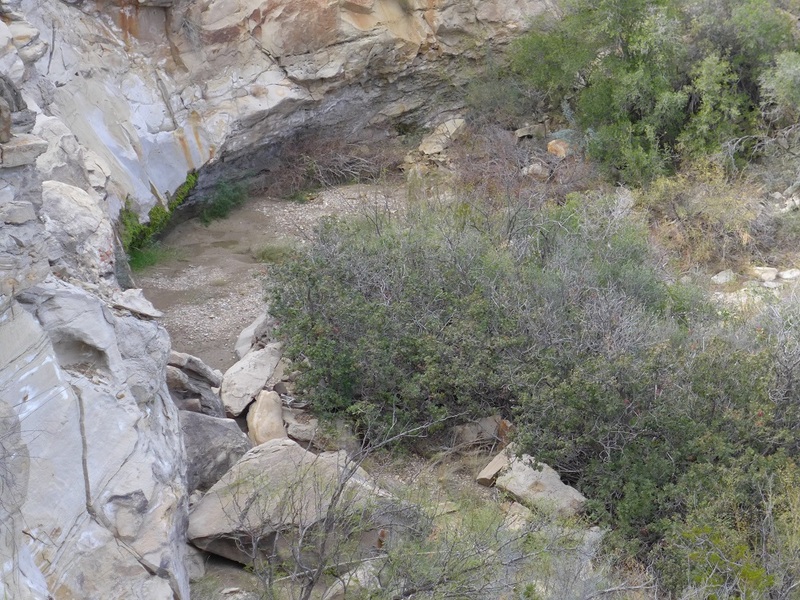 I dropped into the narrow wash and there were a couple of medium sized pools of clear water that slowly dripped over the conglomerate lip down into the tree lined mini canyon. 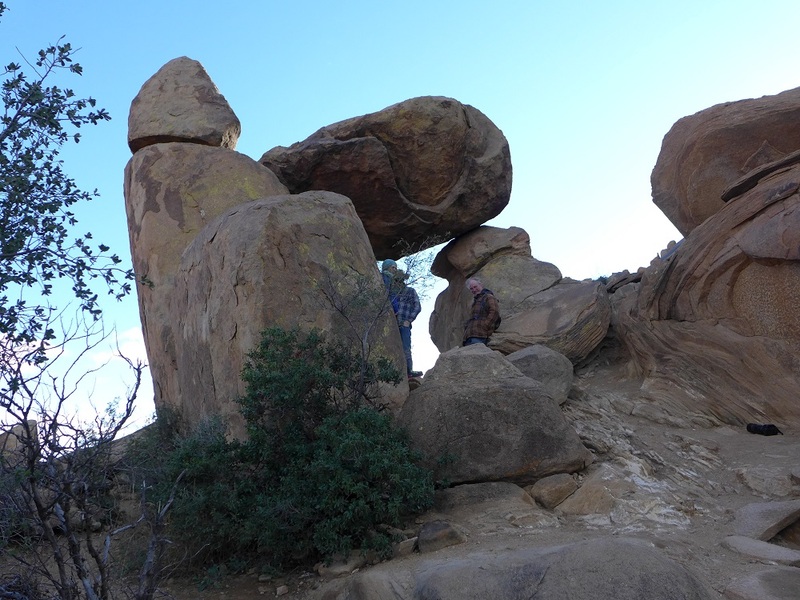 I gathered 5 liters and climbed out the other side to look around the rock house and other ranch infrastructure. They built the house right on the edge of the drop. 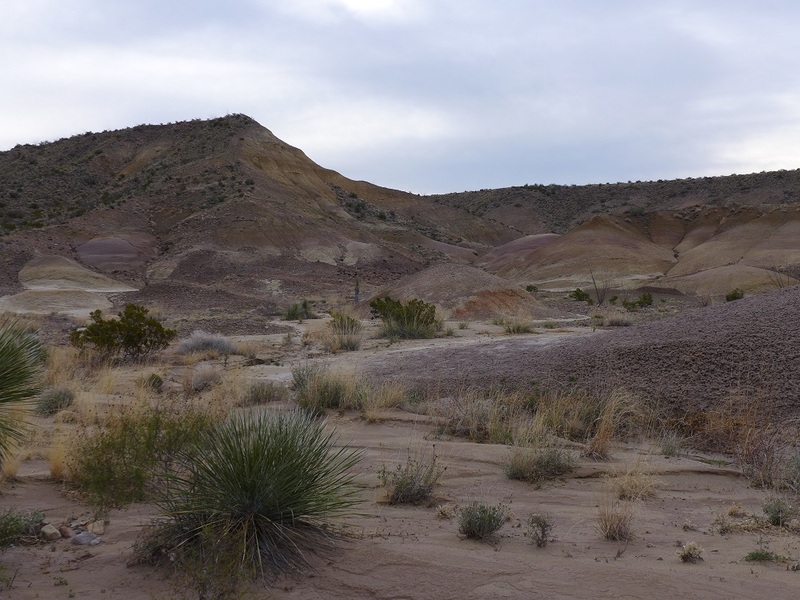 I took a compass reading and headed cross country toward Painted Hills spring. After a while I could see the cottonwoods in the distance which made route finding easy. 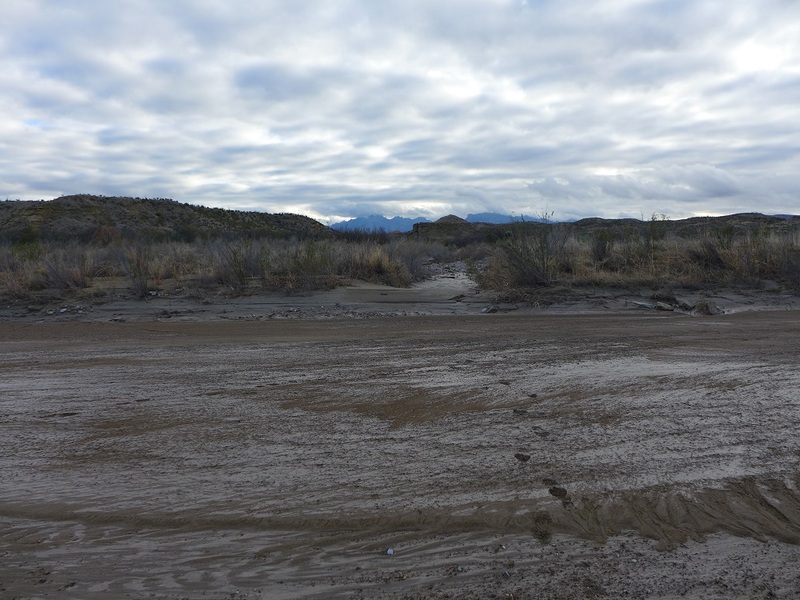 I got to the edge of the wash and could see water for some distance downstream but did not take the time to go down and see how far it went. 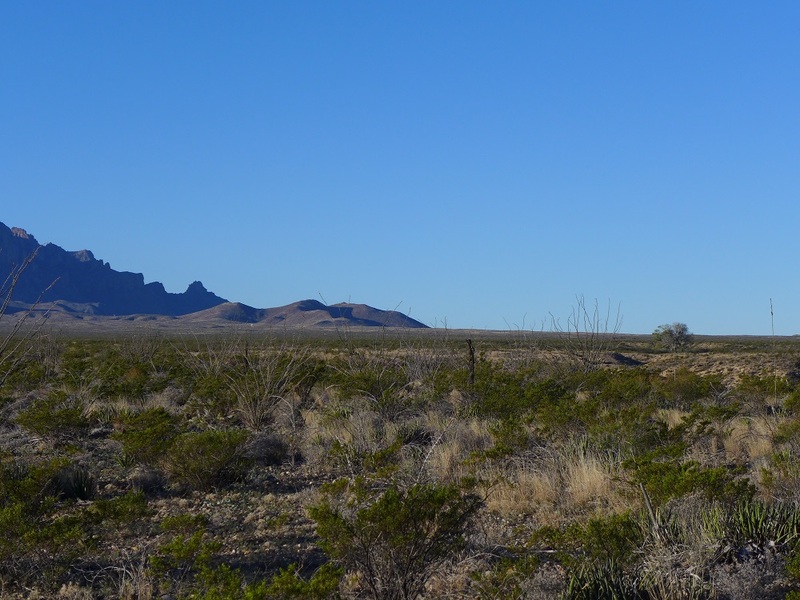 The Corazones and Sombrero Peaks and Terlingua Ranch in the distance. 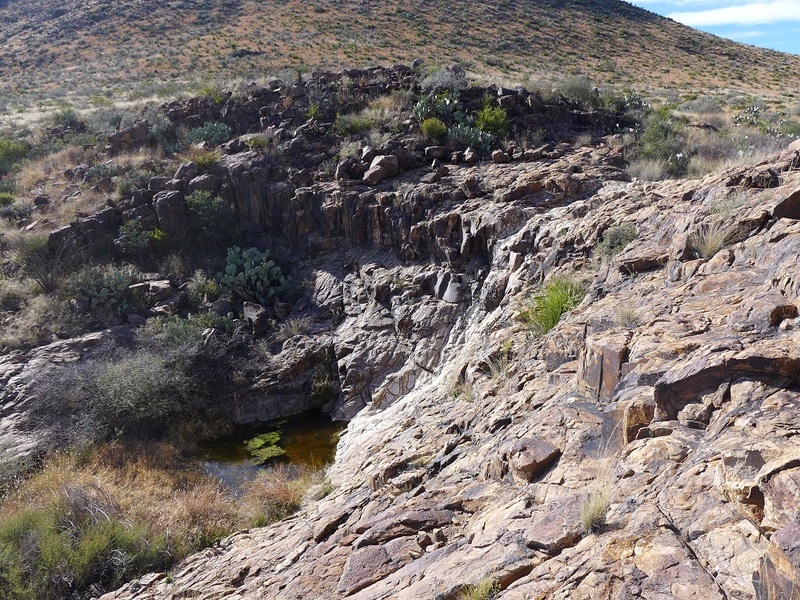 I skirted around the top of the spring area and headed on west towards Onion spring, stopping for lunch along the way at a high point with shade and good views. This ended up being the warmest day of the trip with the high near 70. The cut where Paint Gap seep is, I would walk across the ridge above it in four days. For the whole trip Croton Peak would pretty much command the skyline. 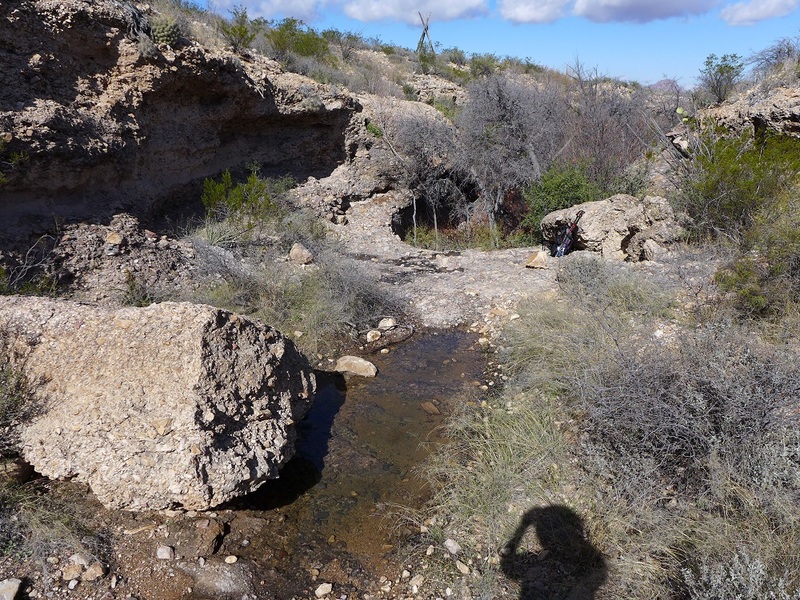 Quick over to Onion spring and there were some small pools in the rock ledges above the spring area but I did not fight my way into the brush to see if the spring was running. Again the house is built right next to the spring area. 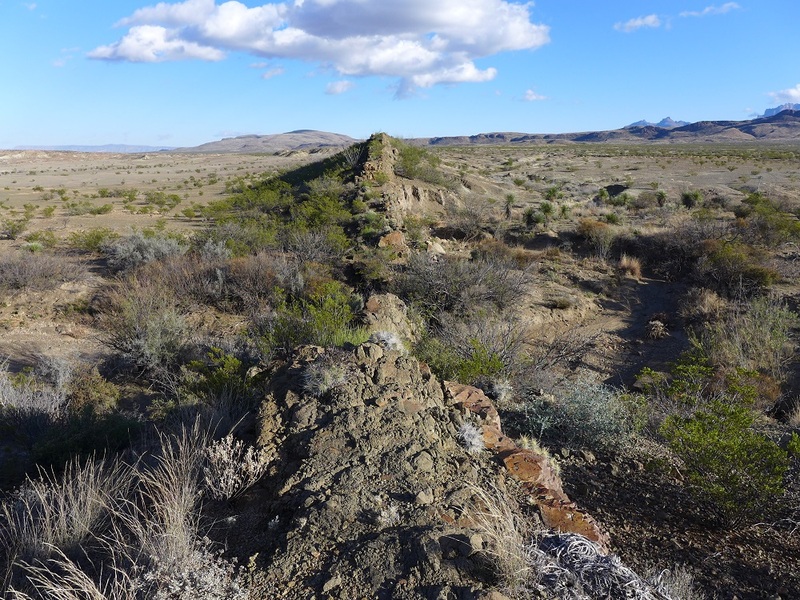 I head out on a line to hit the eastern end of the big dike that cuts across Onion Flat. 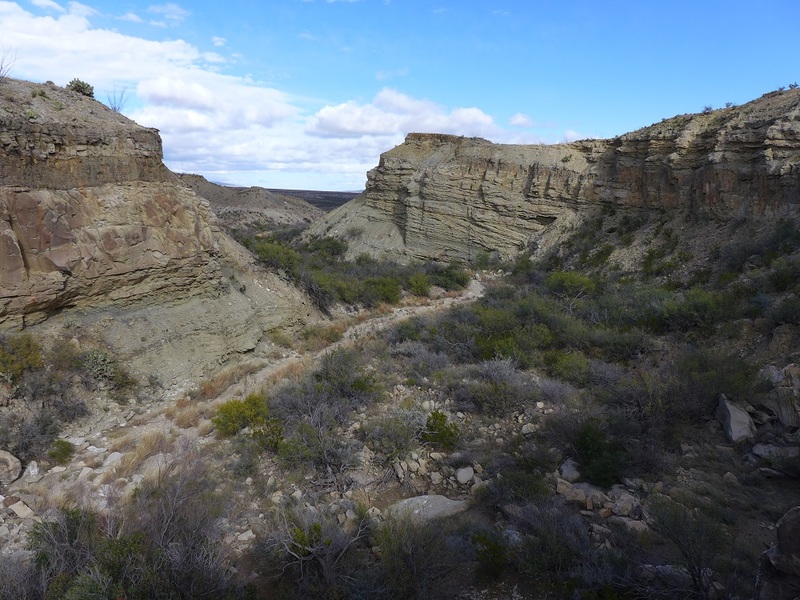 The area is dissected by lots of little washes and hills and I do my best not to get entangled and expend too much energy crossing them, I was marginally successful but with the warmer temps I struggled a little. This picture really doesn’t show the relief well but it is looking back towards Onion spring with the Paint Gap Hills in the back. As I crest a small gap on the very eastern end of the dike I can see my work cut out for me and the whole dike running across the flats towards the Christmas mountains. Normally I would say it looks like easy walking but with the rain and these pure clay flats I was not looking forward to slogging across it. Each step was a shoe sucking experience. 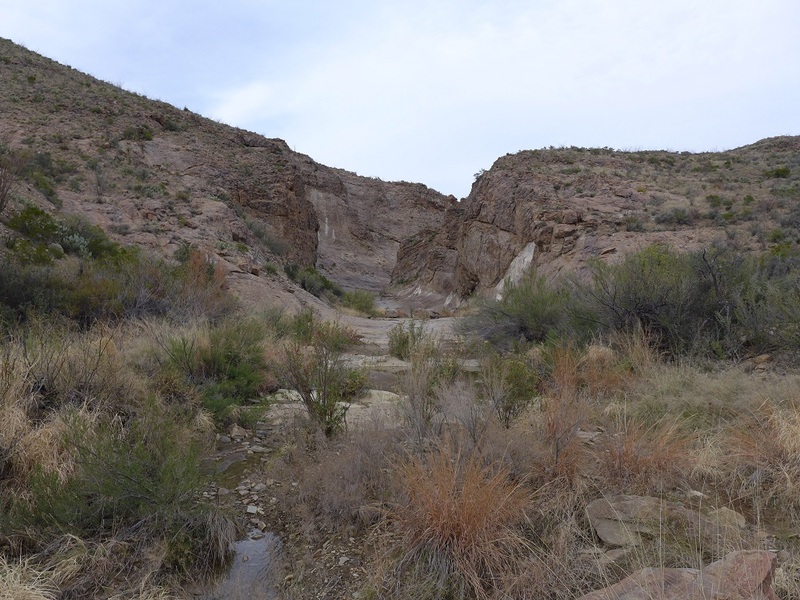 I went north of the dike because I wanted to walk through the gap that is the southern branch of Tornillo creek. Slow going but I made it about 4:00 after 10 miles for the day. This is above the gap looking east. 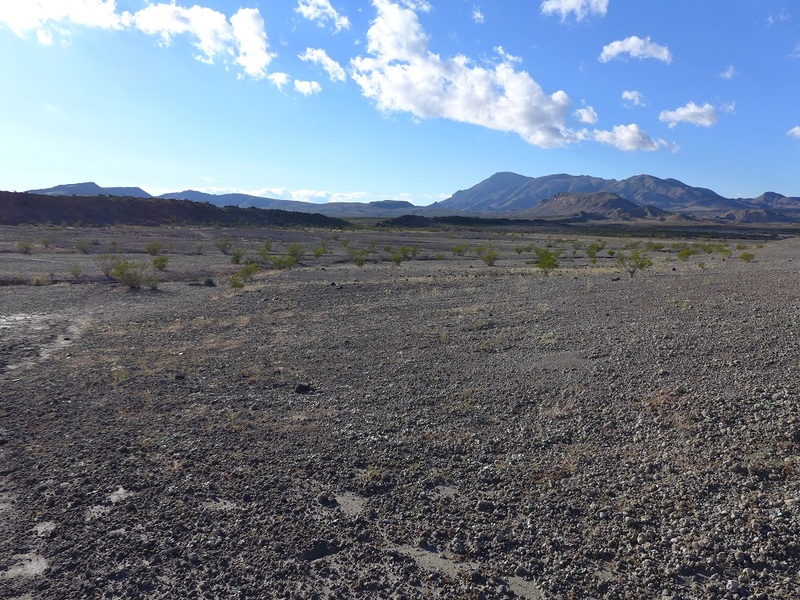 Onion Flat is not as flat as one would think. I hugged the south side of the dike for a while to avoid the washes that run that way. 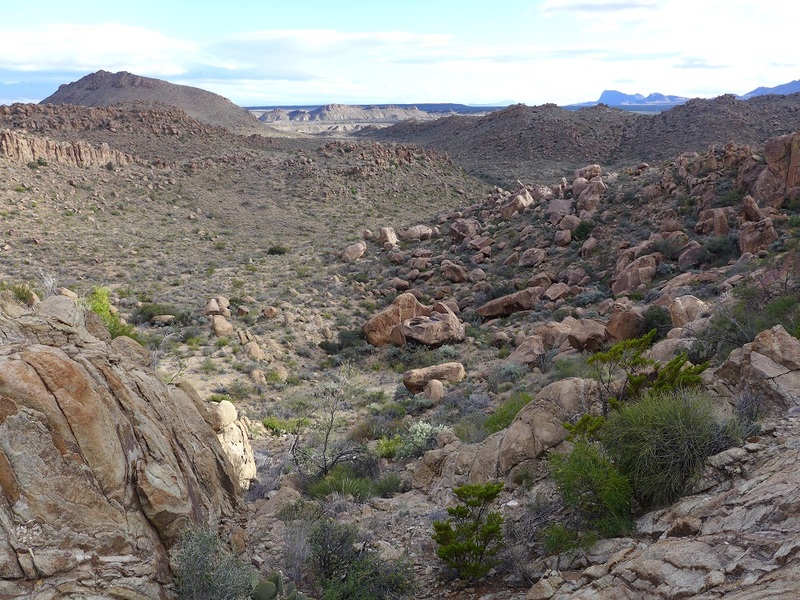 I am getting tired but continue to work my way up the ridges toward the pass over to Rough Run, fighting lechuguilla forests and ravines along the way. 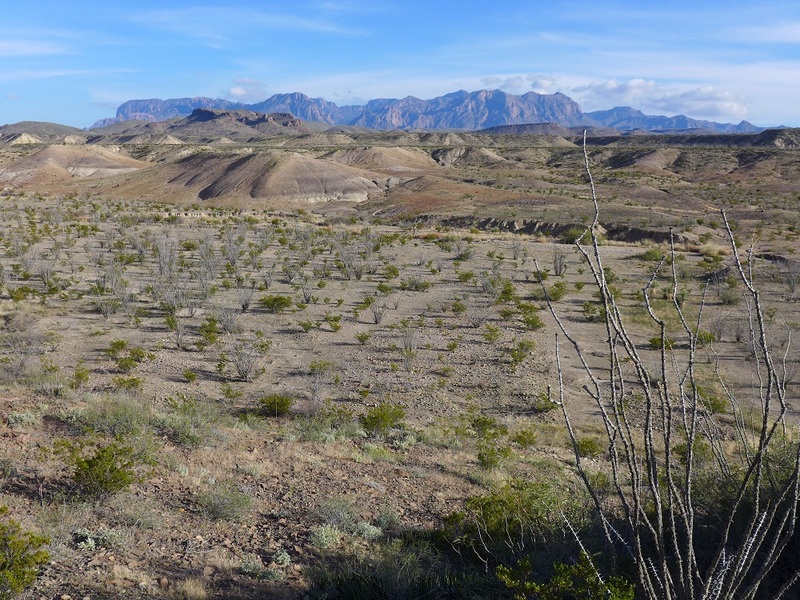 In finally stop on a nice flat with great views of Croton Peak and the Chisos in the background. 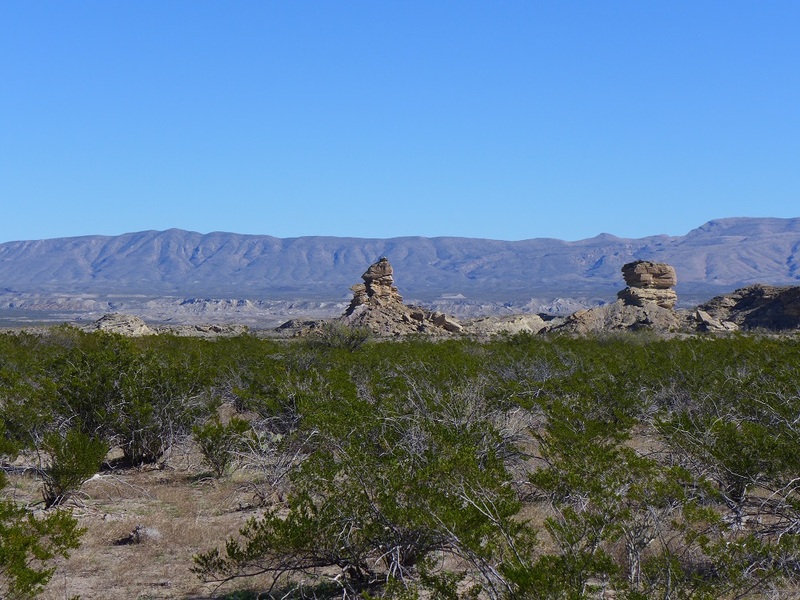 And all of Onion Flat with Painted Gap Hills and Sue Peaks in the far distance. 12.2 miles for the day and in for a nice dinner. I try and call Betsy on the satellite phone but get no answer. Turns out the little bit of snow we were supposed to get turned into 11 inches and the power was out for a day and a half. I owe her for this one for sure! Just after dinner and before I laid down for the night the wind started to blow, not bad at first but eventually steady at 10 mph or so all night. I was fairly exposed on the flat and with temps in the low 40’s I was having a little trouble staying warm in my 35 degree bag. I always cut it close with the sleeping bag to save weight but with one night with soaking dew and now one with wind I was beginning to curse myself. The wind finally died at 4:00 and even though the temperature dropped to 35 degrees I was actually warmer but still waiting for the sun to come up. The sun once again hit early at 7:45, at least I was picking good campsites for early sun. Walking by 9:00 and with fresh legs I was quickly over the top and into Rough Run. Not real wide but very good walking with no mud. 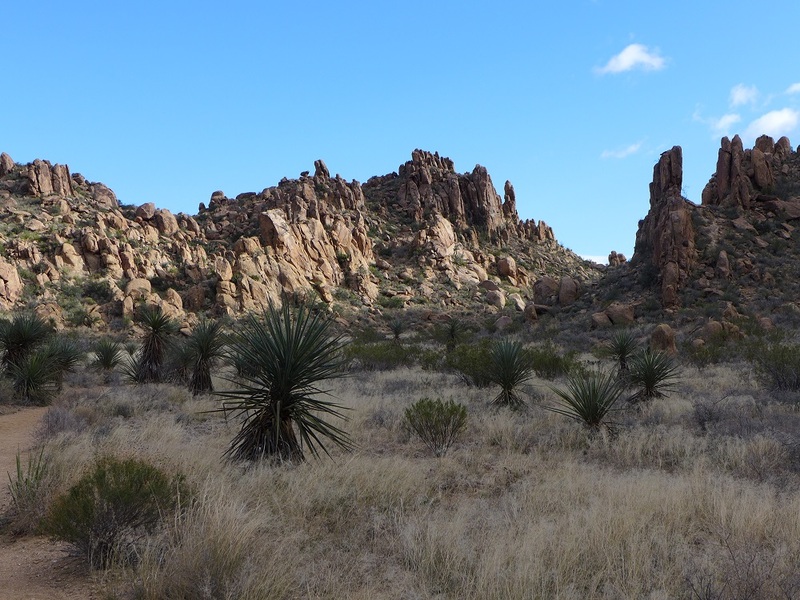 I was amazed with the number of yuccas blooming all over the park in December but they were especially good along this stretch. Big Christmas mountain loomed over my shoulder as I was making great time down wash. There were two small pouroffs to work around but it was easy on the left going down wash. Soon Little Christmas mountain began to control the western skyline. There was only one little stretch of water in the wash this whole section. I was looking for the wash coming in from the east from Serendipity springs but I was rolling along so well that all of a sudden I was at the junction with Oak Creek. 12:00, 6.3 miles so far today. Slickrock mountain had been peaking above the wash banks all the way down but now would be more evident. I will get there tomorrow. Just below the junction there was a new bank collapse that formed a partial blockage of Rough Run. Past this the water started running for about a quarter of a mile dropping over rock ledges, pretty clear but still not the best. 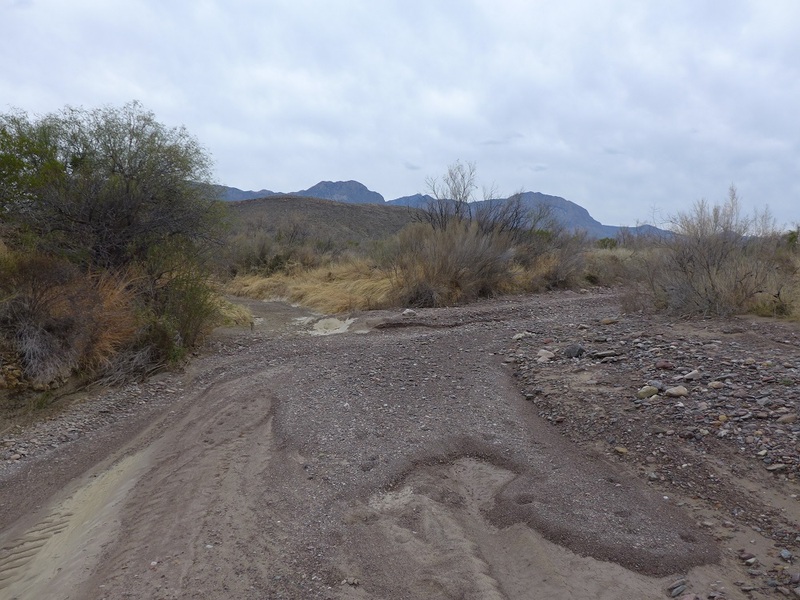 It finally went under the gravels as it culminated in a tight narrow hardrock canyon. Which ended in a big mud pit that I climbed around to avoid, I was not getting into that mess! There was clearly water running down the wash a few days ago, this guy did not make the swim. Rough Run here really starts to widen and in places becomes a bit diffuse as to which channel is the main one. Slickrock mountain standing large with Croton just visible. I would still occasionally take the wrong channel and end up having to avoid the slick spots. 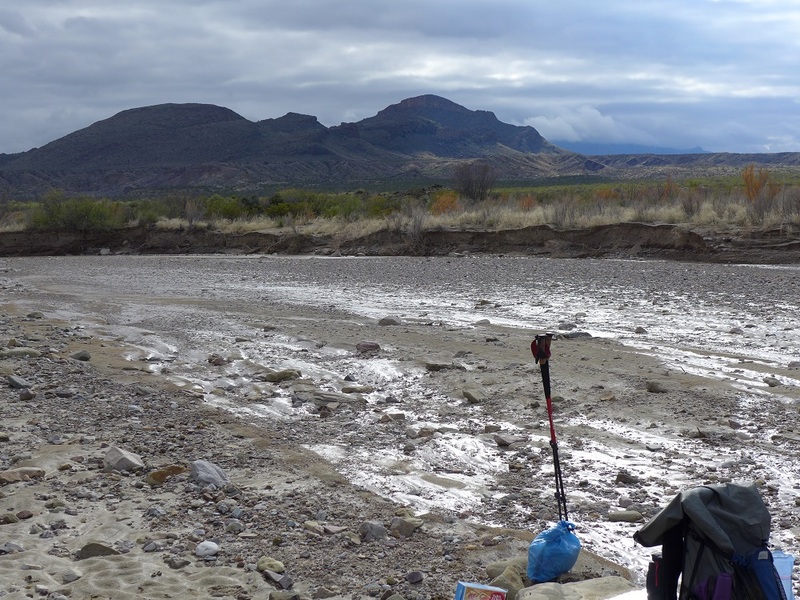 I am looking for where Cottonwood creek comes in from the east and finally reach it by 1:00. Looking for a spot for lunch and it is harder than one would think to find a dry spot with a little shade as all the usual places had thin slicks of mud. Finally after 9.5 miles I find one just before 2:00. 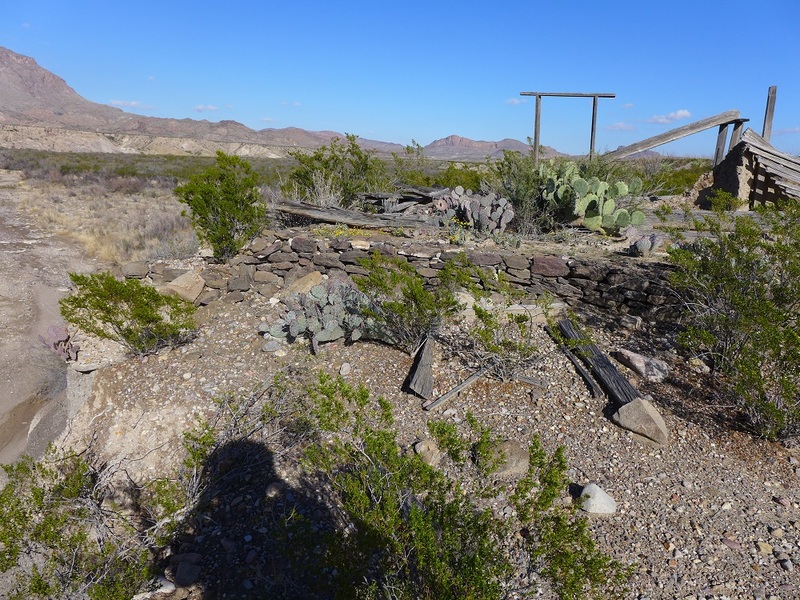 After lunch I climb up onto the bench on the left/south side looking for the Cartledge ranch ruins. The wash here also takes a big swing to the north so I am able to cut the corner as well. First I am surprised by another power line running down here parallel to the wash, it looks out of commission as some of the lines are on the ground. I do soon see the ruins to my right, just on the edge of the Rough Run cut bank. They had a great view of Dogie Mountain and vicinity. This was a really nice house with at least three rooms, a front porch and more. Clearly adobe with the door frames still standing. 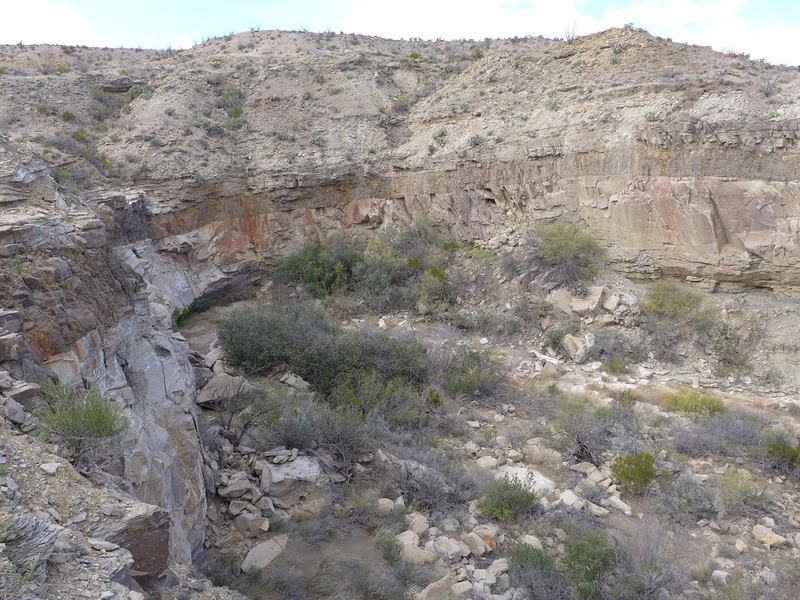 It is a bit hard to see but the stone foundation is literally on the edge of the precipice, thirty feet or more straight down to the wash. There is a large wooden corral here too. From the edge of the bench I can see the volcanic dike that cuts across Rough Run not too far downstream and I am pretty quickly down to it. Instead of going all the way down to where the Dike Tinaja wash comes into Rough Run I cut the corner a bit and arrive at the big pool at 3:45. It is pretty milky but I collect a couple of liters and then I climb around the left side to get to the top to look for a campsite. I was impressed by the wildlife trail cut into the banks on the right side, lots of animals coming to drink here. 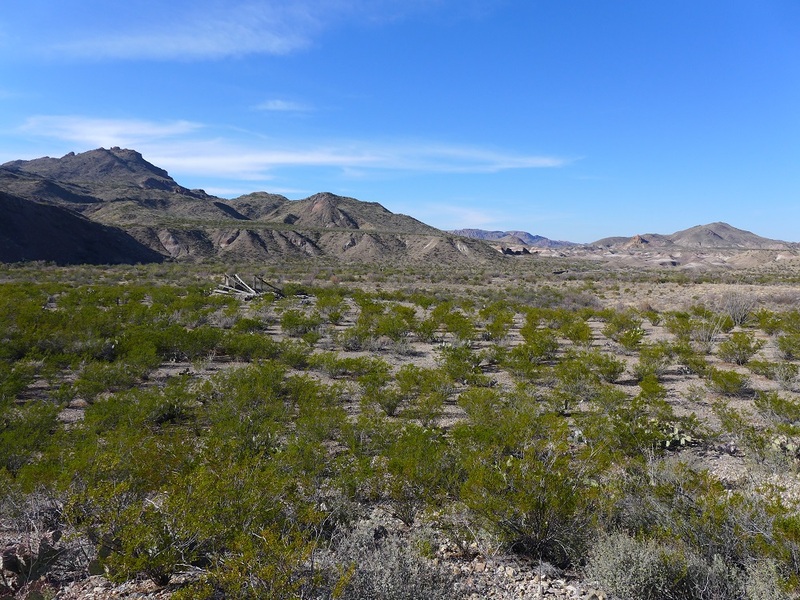 I crest over the ridge with a great view and a lovely ocotillo flat to camp on. 4:00 and 11.8 miles for the day. Early and I consider jumping the park road and heading to Swirl Tinaja to see it full of water as I had two hours of daylight left but decided to rest in the shade and catch up on notes and rest my feet instead. There is a nice view from the top of the pouroff into the pool and you can see that the water runs all the way down to Rough Run. This is the furthest western point of my trip and now I will start to work my way back to the car at Fossil Bone. I can’t see the road and am three quarters of a mile from it but I can hear the traffic, fortunately I cannot see any headlights. A good evening but it is clouding up again so not much star viewing tonight. Sunset over the dike. Still mostly clouded over but at least I get my first sunrise color of the trip. With the cloud cover the low is only 42 degrees but it was still last night and I am hit with more heavy dew. With no sun there will be no drying stuff until later in the day so I pack it up damp and I am walking again by 9:00. My last camp chore was to decant the clearer water into my water bottle from the Platypus that had been settling all night, this is the delicious material that was left. 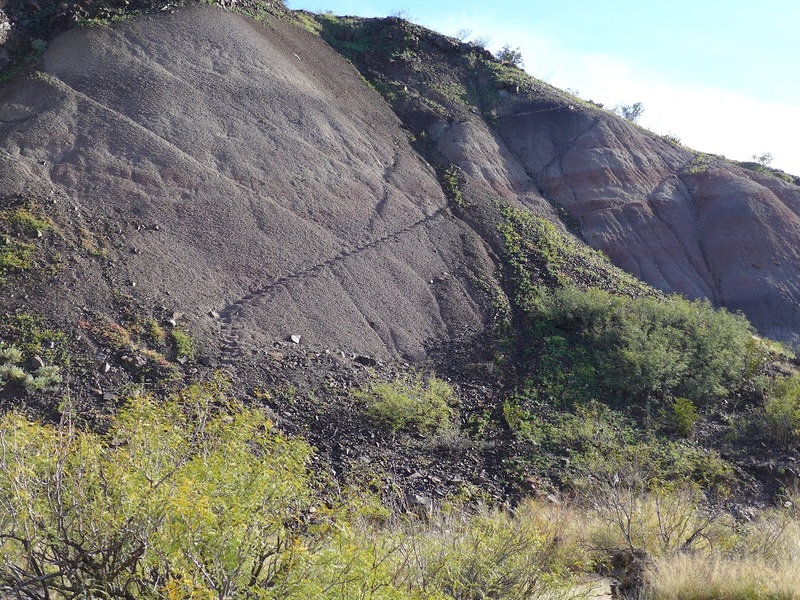 I know that I am heading up into the clay hills and want to be very careful about staying in the main wash so I don’t walk by my food cache. 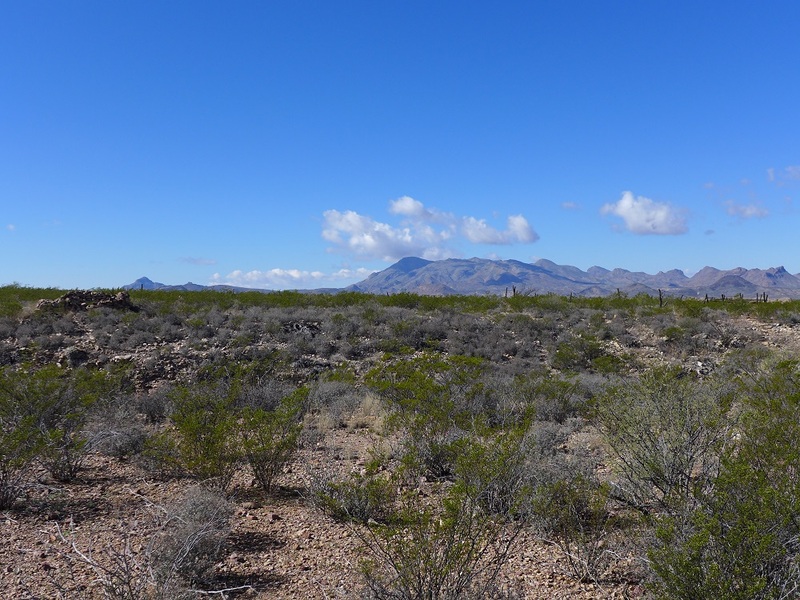 The end of Burro Mesa in the distance. 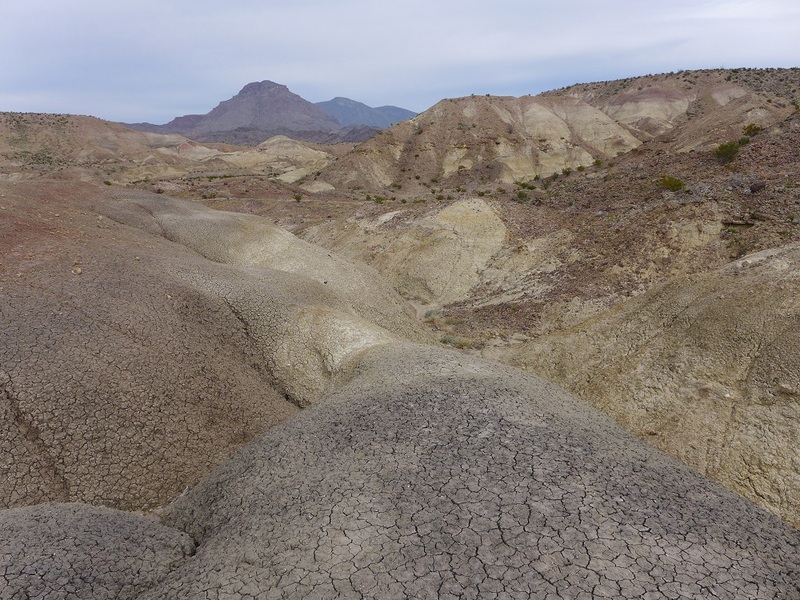 I love the colors of the clay hills but they do have a tendency to all look alike. I come to a major Y in wash and decide to take the right hand fork thinking it looked more familiar. 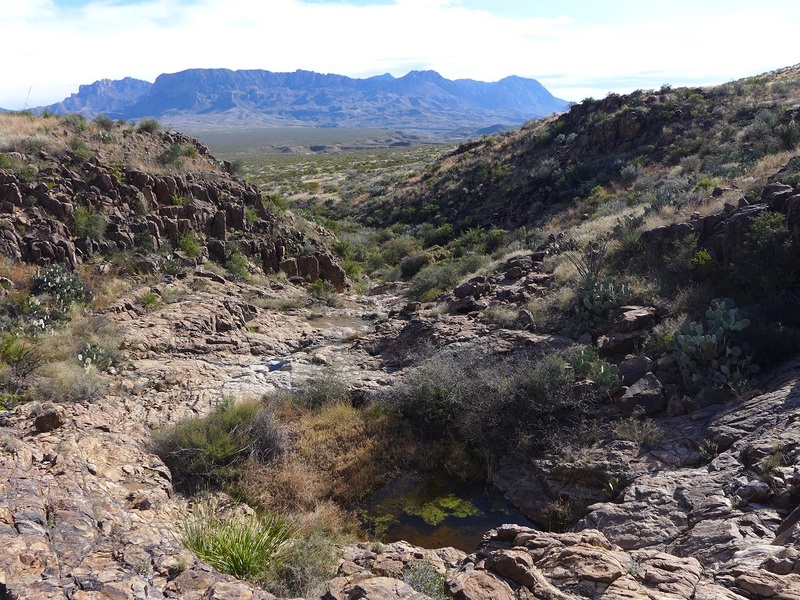 Very quickly I realize it is not correct and climb over the small ridge in between the two washes and head up stream looking for my cache under a bush. I did have GPS coordinates but using my small Holux data logger I have to transfer those to the paper map which is not an exact process. In a hundred yards or so I see foot prints coming down wash and recognize them as mine from setting out my cache four days ago. I turn around head back down stream and there is my small bear canister just down wash from where I cut across the ridge, I had literally walked right by it. Much relieved I had already decided that instead of just taking the food with me I would take the whole thing, canister and all, and leave it in two days with my large bear canister at the Paint Gap road, it would make retrieving them much easier at the end of the trip and it only added two pounds to my pack. I slipped it down into my pack and continued up the wash to its end where I climbed up to the divide. This is looking back through the clay hills I just came through, Maverick mountain in the distance. Looking down the other side I have more cut up clay badlands to work through on my way to Cottonwood wash. Slickrock mountain in the distance, where I am headed for tonight. 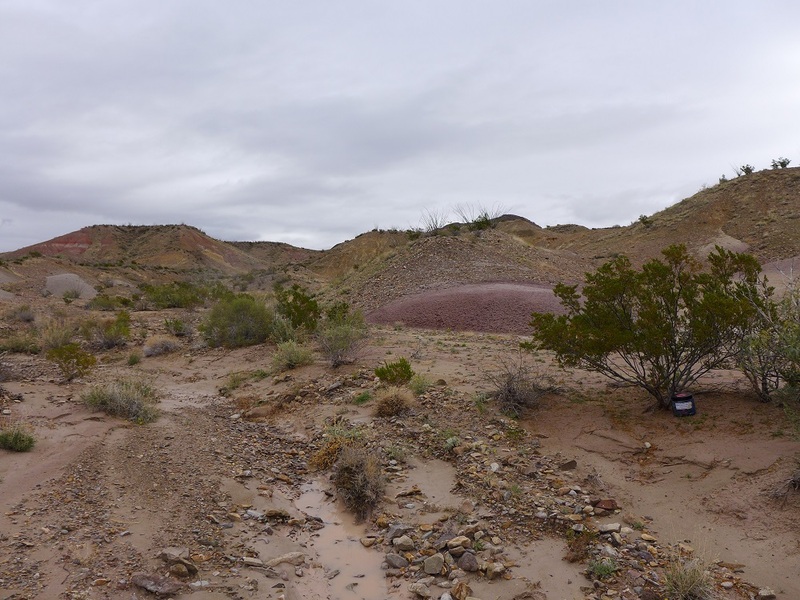 I wound my way down this wash until it intersects a larger one and head up stream for a bit before cutting across a low gap in the ridge only to find another series of clay hills, I am in clay hill hell but things have dried out enough that it is not as soft or sticky. Fortunately it is overcast and cool as these hills can be hot and stifling in full sun. Over one more ridgeline and I pop out at the top of a 50 foot high cut bank overlooking Cottonwood creek and that same damn powerline, note the wires laying on the ground. I work my way down into the wash and it is pretty good walking. I come to the first of two sections of running water this one near the word Creek on the topo map. I take a short break about noon after 5 miles, the shoes are still getting caked with mud but not as bad as the first few days. I am finally in my hiking groove, it always takes a few days to really hit it with navigation, pace, foot placement and line choice, pack balance and the rest. I have had a few periods in the early days but now it all seems to be rolling together and the walking seems mostly effortless. Working my way through the complicated badlands seemed to bring it all around. 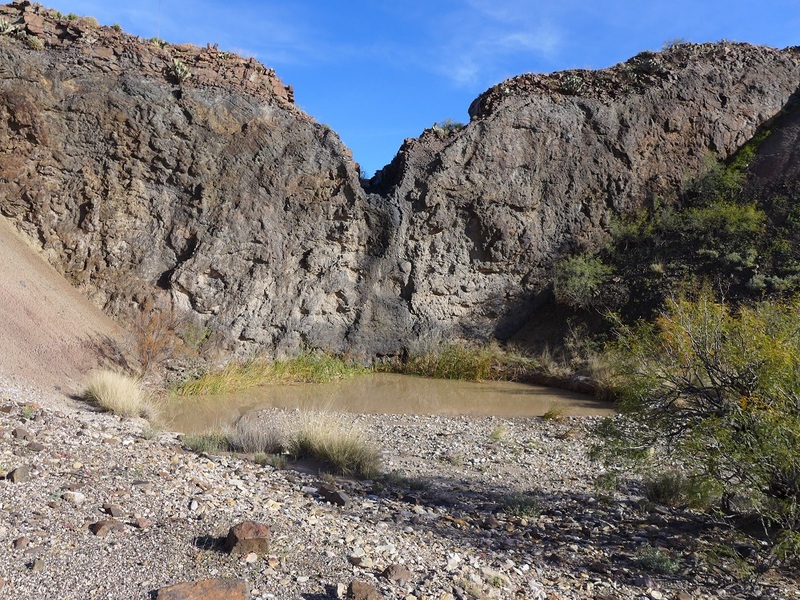 The second section of flowing water is down wash from the break in the ridgeline where it cuts through from the east. It had nice long sections with small water falls in places and that powerline. 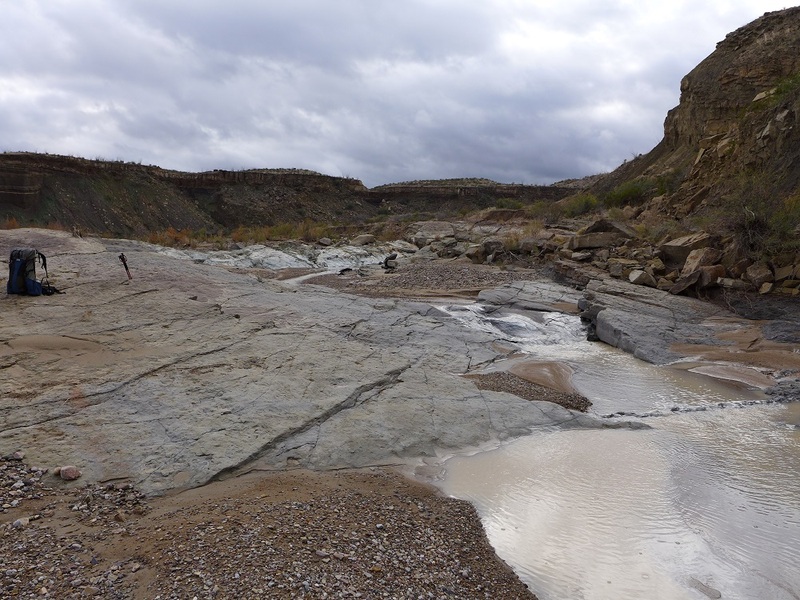 Just before 1:00 I get to the break and climb up left onto a rock ledge were several washes come together. 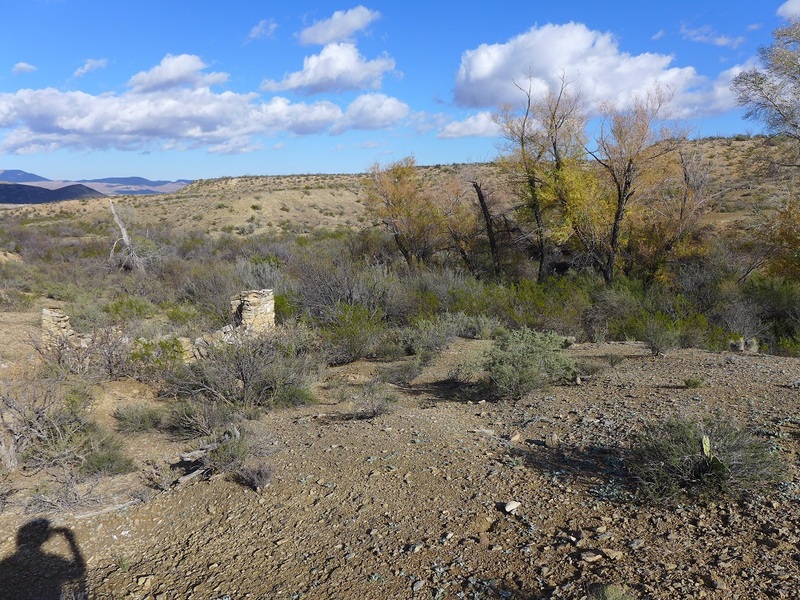 This is looking up Cottonwood wash in the direction of the Sam Nail ranch. Immediately more mud and I pause to consider lunch on the dry rock ledge. I decide with the warmer temperatures and milky sun I should take the opportunity to dry my stuff so I commence with a full yard sale with everything strewn about. After a long break I repack all the now dry goods and head due north towards Slickrock canyon. Easy walking over the broad and low divide between Oak creek and Cottonwood creek made for fast travel. 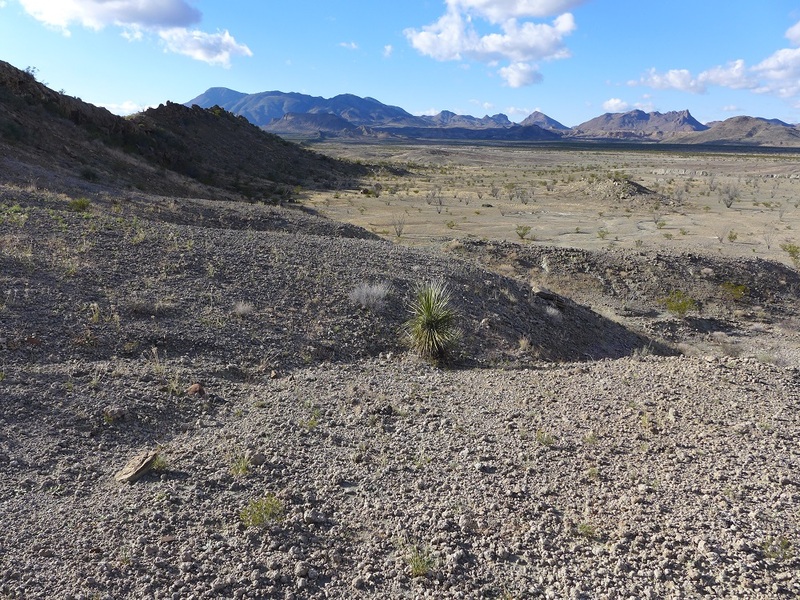 Big vistas- left to right Little Christmas mountain, Big Christmas mountains, Slickrock mountain, the tiny slot of Slickrock canyon just right of center, Croton Peak, Paint Gap Hills. Lots of very healthy looking jack rabbits everywhere. 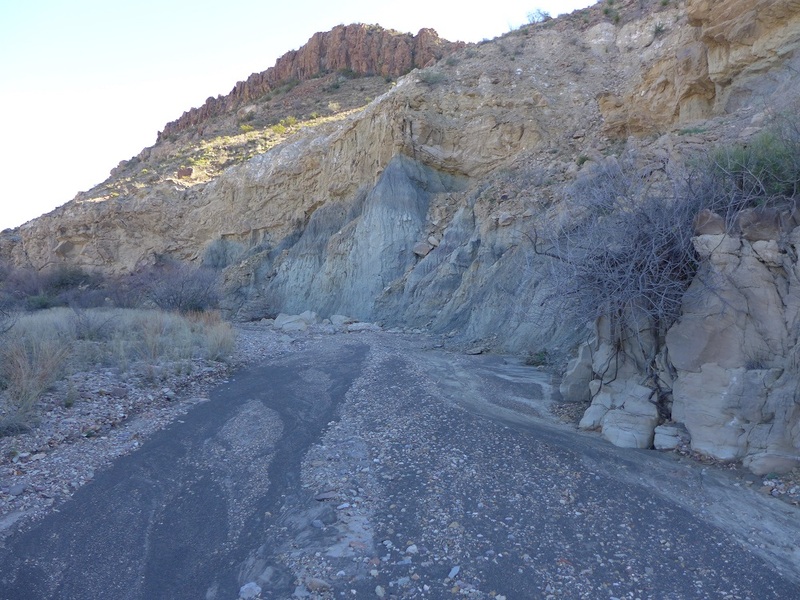 I cross Oak Creek and cut the corner a bit on the Slickrock canyon wash but eventually drop into it and follow it up to the mouth of the canyon with a fair amount of water as I approach it. 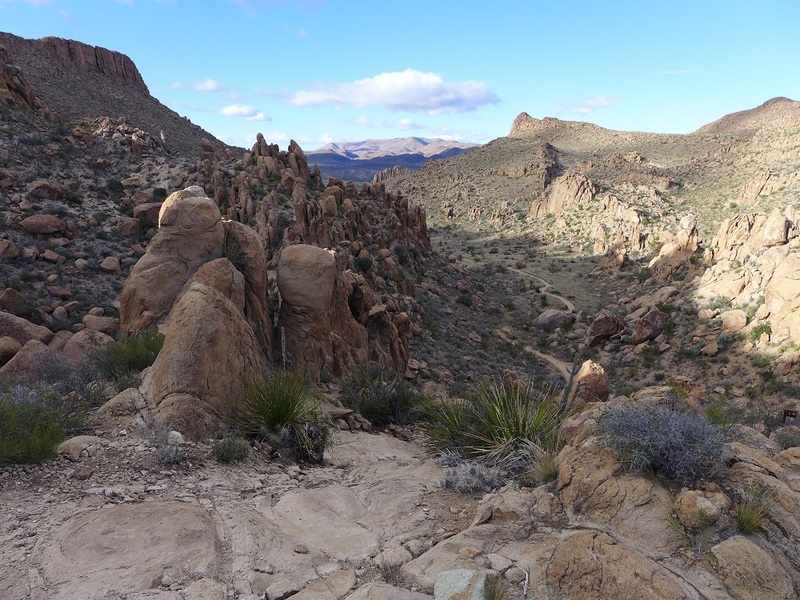 and shortly after that I hear some rocks clattering down the cliffs above me, one makes it all the way to the bottom, probably Aoudad. I go a bit further to get a view of the quilted hills to the north and decide that I in fact did not want to carry the pack up here to camp so headed back down. Tons of water in the huge pools, one slowly flowing into the next. They are not real deep but should last for months. 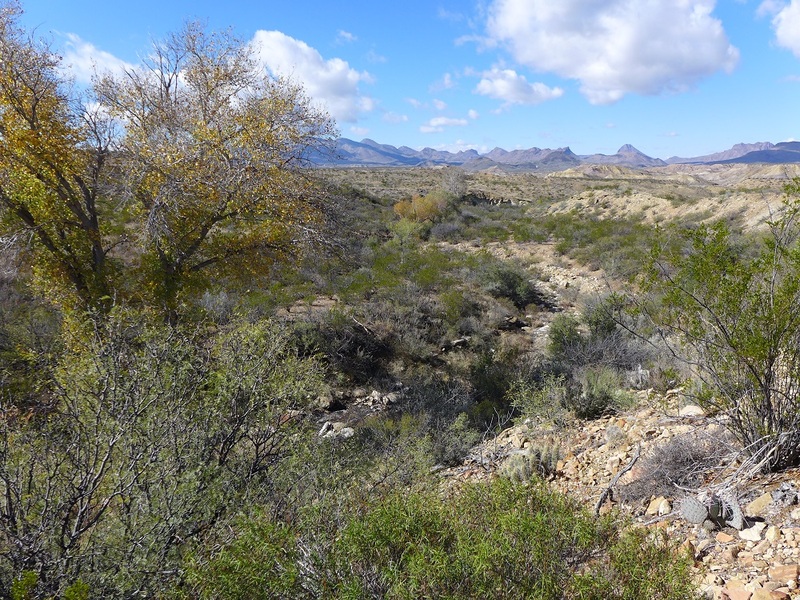 I dip up a bit of nice clear water and climb up on the bench to the left (looking downstream) of the mouth to a nice campsite with good views of the Chisos and parts of Burro Mesa. It cleared more and the sun popped out for the end of the day. While I am well over two miles from the road I can once again hear traffic. I cannot see the road or headlights but it is one drawback of camping on this side of the hills. I do finally hear my first canyon wren of the trip, a sure sign I am in the desert to go along with the nightly yips from the coyote packs and the all night calling of the Great Horned owls. It was a pleasant evening. The sky cleared about 9:00 p.m. and then when I rolled over at 4:00 a.m. and it was completely overcast again. 46 degrees the low and finally not much dew. Walking by 9:00 again, carrying 4 liters of water which is enough to get me to the water cache on Paint Gap road tomorrow morning. Quickly down to the junction with Oak creek. Up Oak creek and it is pretty rocky walking. I take one break along here but I am moving along pretty fast. By 10:30, after 4 miles, I am at the Croton springs wash junction and hang a left up it. I cross under the same damn powerline which runs across here too. 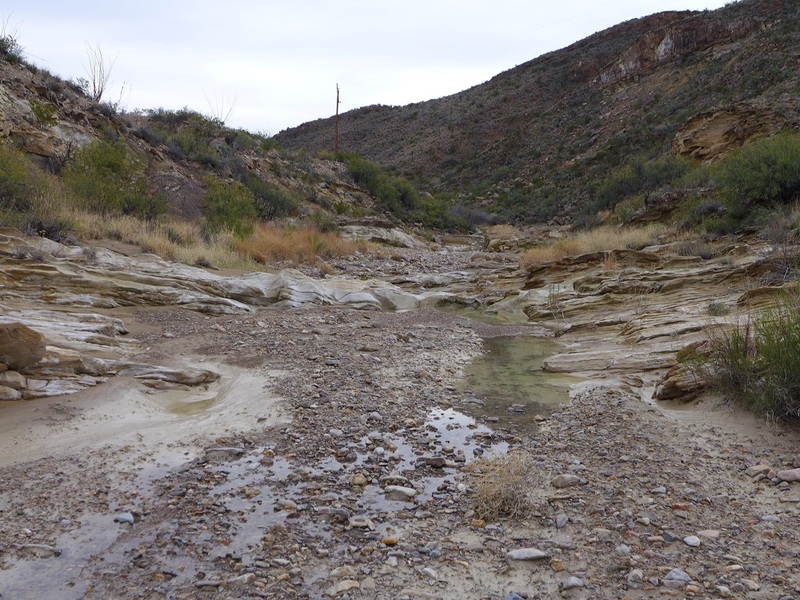 Lots of yellow, silty water all the way up the little canyon it carves until it opens up near the Croton Springs campsites. I realize I am off course and cut back across country to get into the correct wash. 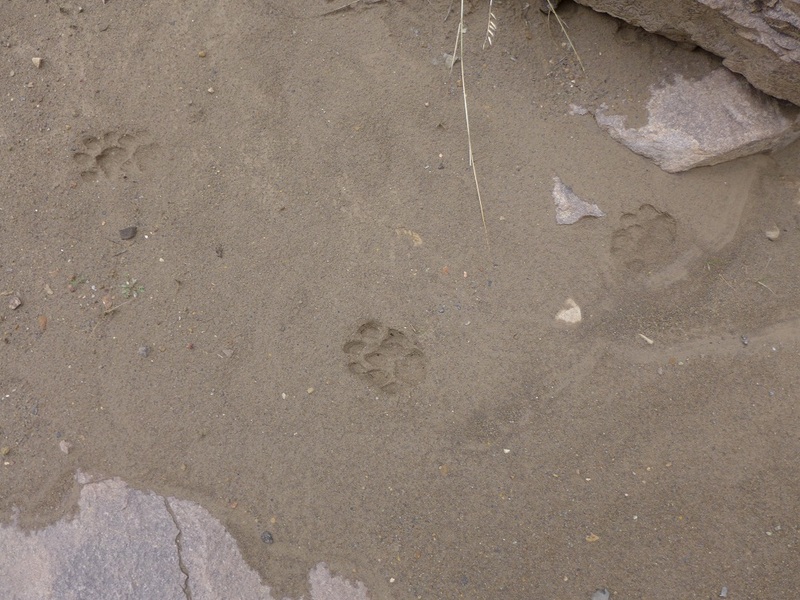 It cuts through a narrow section with high cut banks and there I find a super clear and fresh set of bear tracks in the mud going down stream. 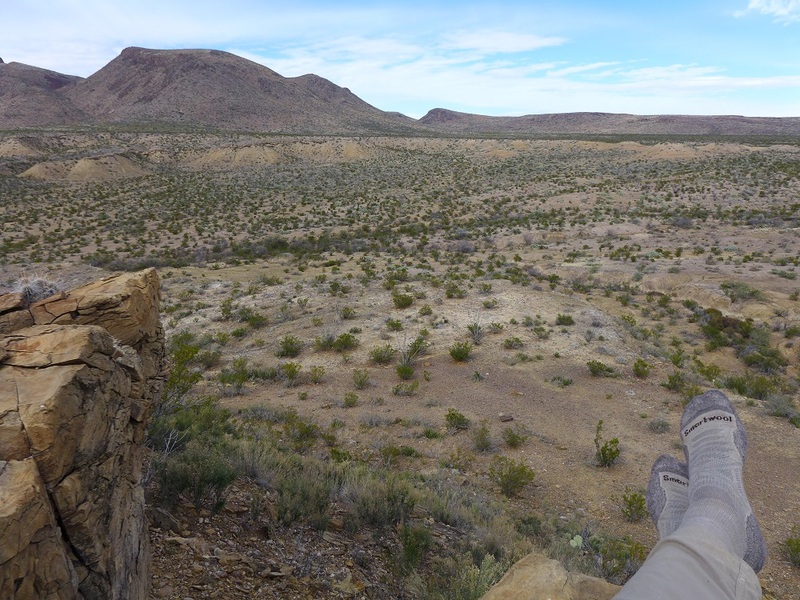 At 1:00 after 8 miles I climb up to a high point between two washes to get a view and have lunch. It has been pretty cool all day and I find a place out of the wind to set down. I am right under the boundary between clouds to the south and blue sky to the north. This is looking back down the Croton Springs wash where I have come from. 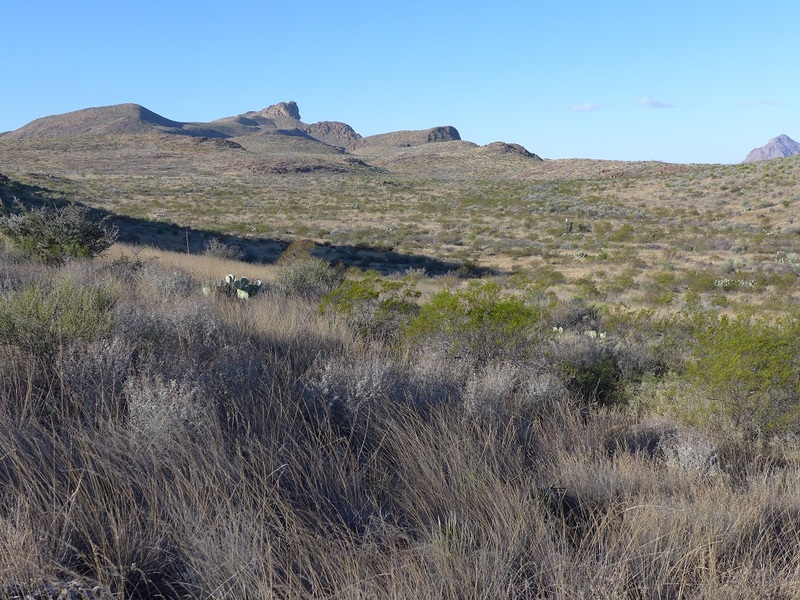 This is where I am heading this afternoon, the small peak dead center. The eastern slopes of Croton Peak on the left. and this little cactus that looked like someone just dropped it in the crack. After lunch I head out on a beeline for the cut in the hills. 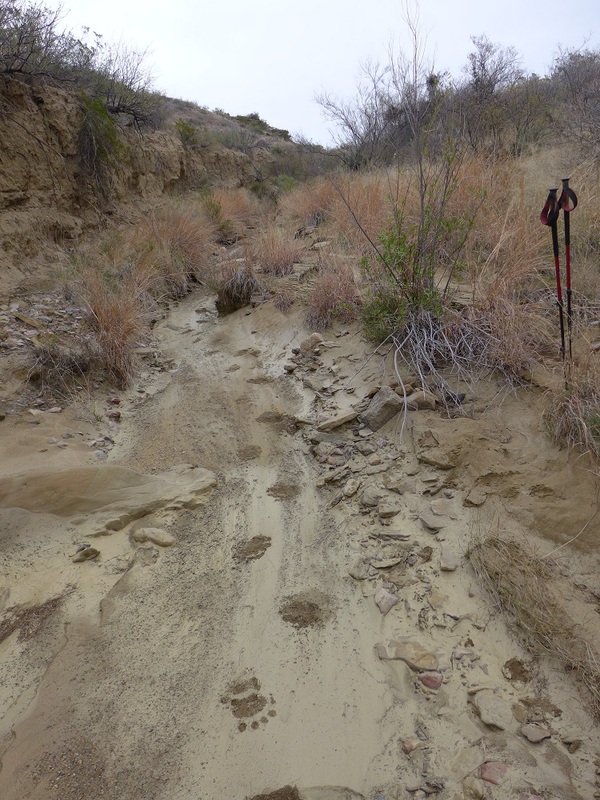 Pretty easy walking up the fingers of the alluvial fan. At one point I scare up 8 Mule deer does and watch as they effortlessly bound their way a half mile across and half way up the side of the peak in the shot above. Amazing. This is the view from the top of the pouroff back towards where I had lunch. I climbed up to the top of the ridge below the little peak looking for a campsite. Here I scared up two of the biggest Mule deer bucks I have ever seen, both with huge racks. This is the second one, the first was even bigger. Sorry for my crappy point and shoot telephoto lens. 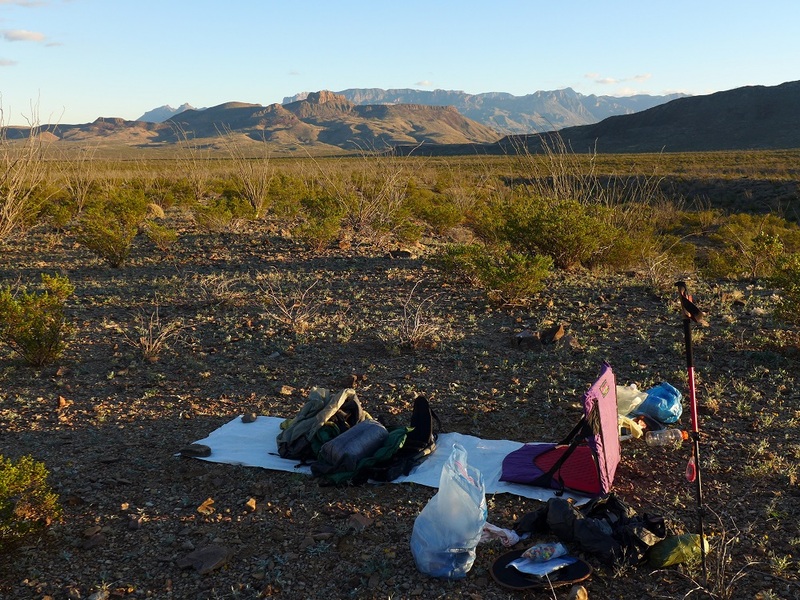 I find my favorite kind of campsite in a creosote/ocotillo flat and drop my pack at 3:30, just over 10 miles for the day. I had contemplated climbing Croton Peak from here but just wasn’t feeling the energy after the days hike. 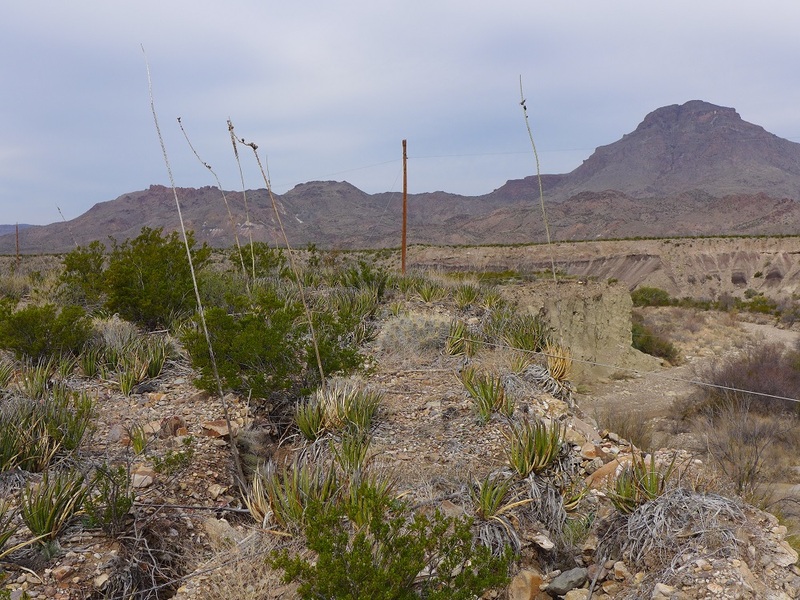 Instead I walked up the little peak behind my campsite to 4000’, 600 feet shy of Croton’s elevation and took in the views to the north- Croton Peak, Little Christmas, Big Christmas, the Corazones and Sombrero Peak and Terlingua ranch. It had cleared off and was a beautiful late afternoon. 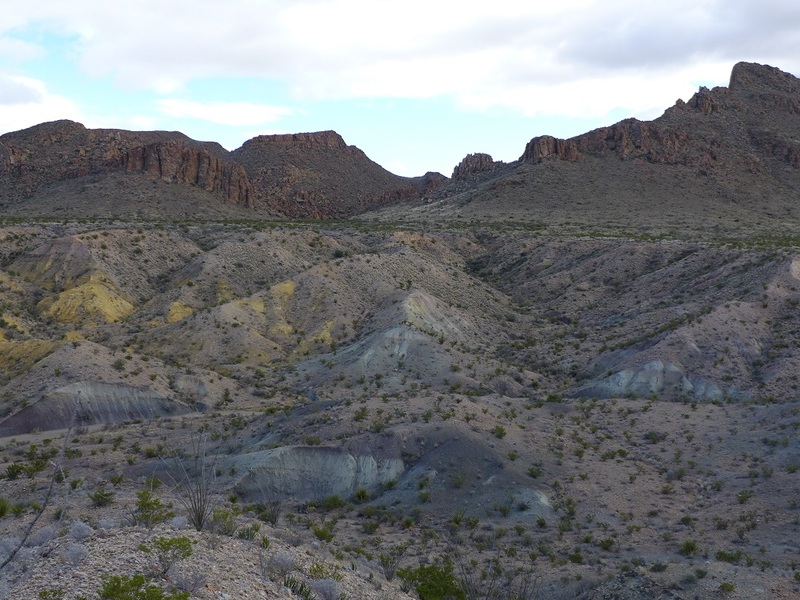 To the south- Painted Gap Hills, Dead Horse mountains, the Sierra del Carmens and of course the Chisos. I looked closely at the route I would take tomorrow across the hills towards Paint Gap, didn’t look too bad. 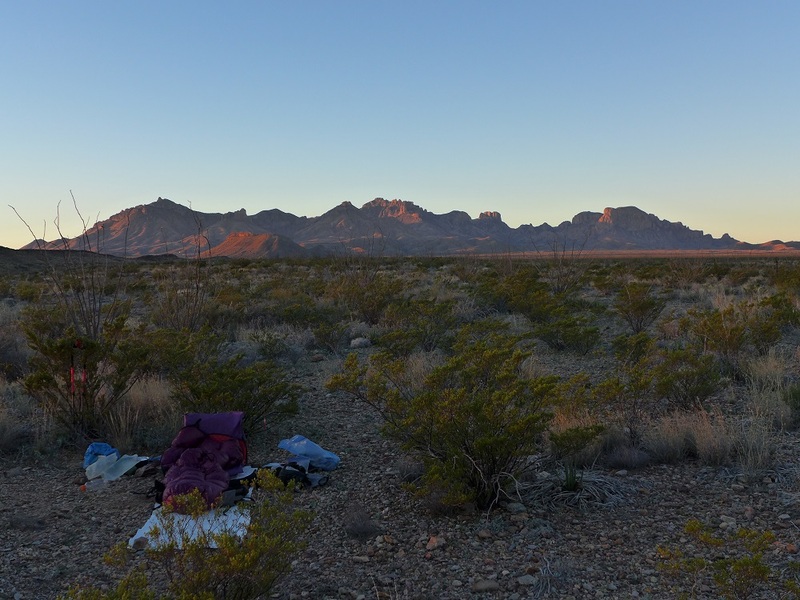 I headed back down and set up camp with expansive views. I settled in for a nice dinner taking in the views of the Rosillos. 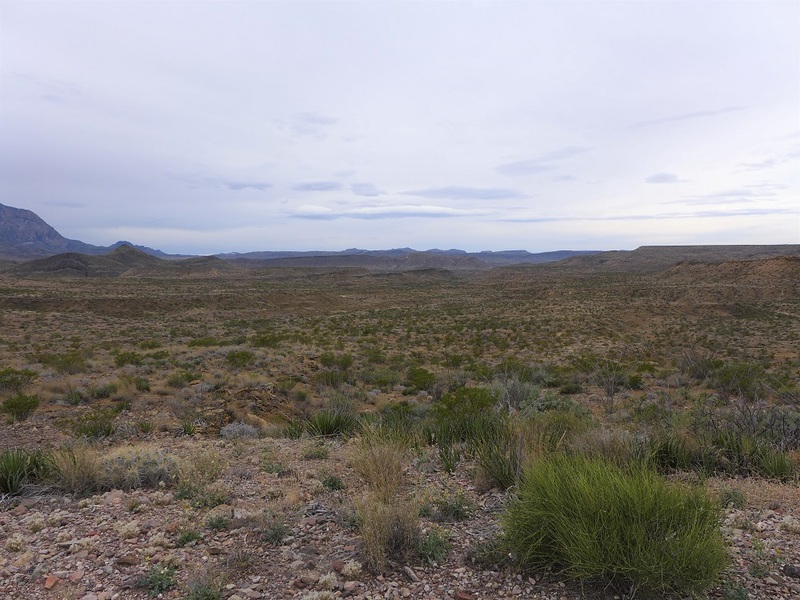 I could see a few lights from Terlingua Ranch and if I stood up some lights from cars on the road near Panther Junction. 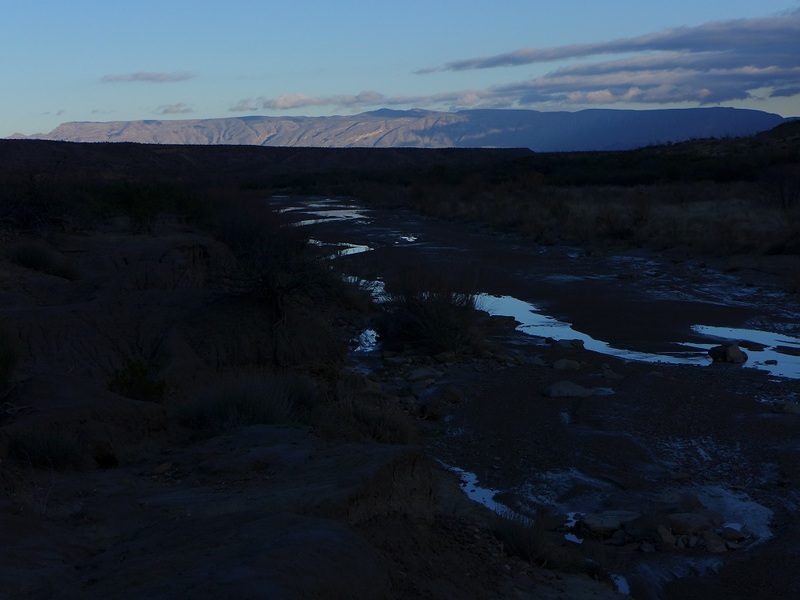 And the sun setting on the Sierra del Carmens. Betsy had sent me a message warning that strong front was coming through. I thought it must have been the cold and cloudy day I had just walked through and it now had moved out and cleared up. Just in case I made sure everything was tucked away in waterproof bags, there were some dark clouds moving in from the northwest. About 7:30, just as I was thinking about calling it a night, I felt a few drops of rain, crap. I jumped up to put the tarp up and huge winds hit hard. It was a battle to get the tarp up in the winds but I finally got it firmly staked with extra rocks to back the stakes up. Fortunately it was only a light rain while I was getting situated. I crawled in and a steady light rain started that lasted an hour or so. By midnight it had passed and the sky cleared completely but the wind blew all night long. I walked back up to my pack. 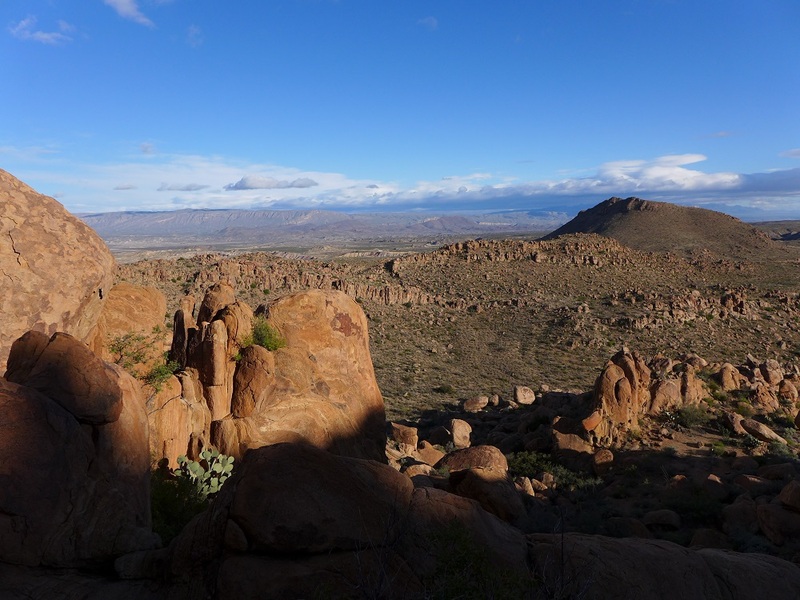 I had planned to camp here but it was too early and it was too chilly to just sit around so I decided to head towards Grapevine Hills and the Balanced Rock even though it would assuredly break my no people streak. 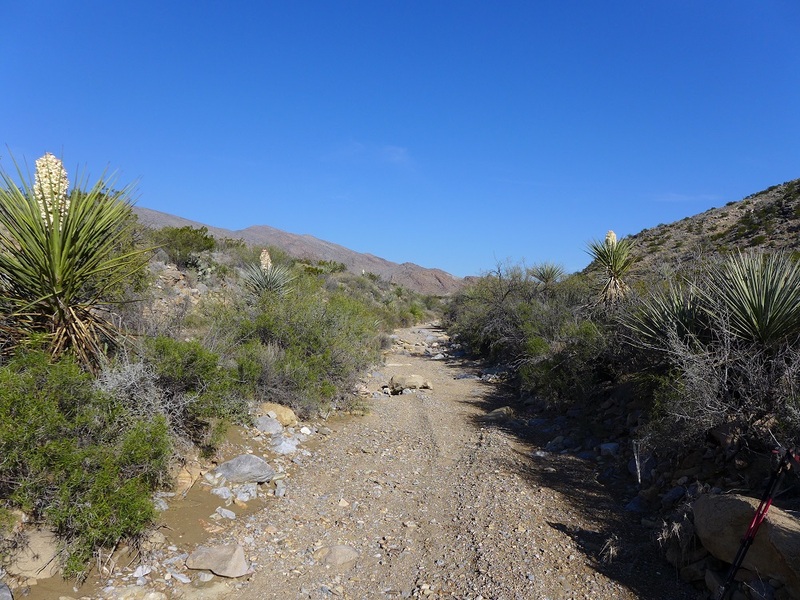 Off I headed across one more wash to the parking lot for the trail. The drop down the backside was really easy and soon I was cruising down the wash.
And my wide open camp with early color on the Chisos. 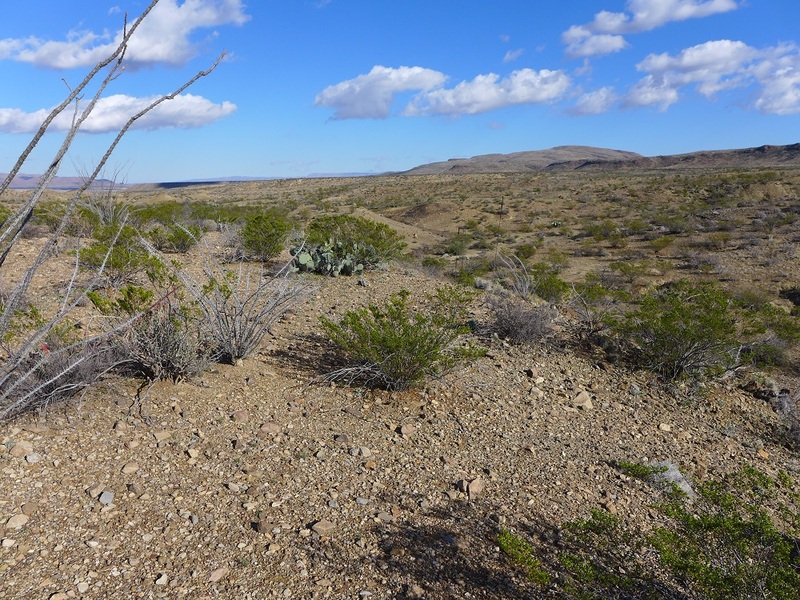 After breakfast but before hoisting the pack I walked down to the end of the bench overlooking the wash I walked down yesterday afternoon from Grapevine Hills trying to see if I could see any sign of Fertile Sands spring, no indication of any water down there. Back to camp and I can see my first objective this glorious last morning on the trail, the big cottonwoods at Neville spring. I drop back down into the wash and follow it towards the spring, first having to work around a small pouroff. I get to the stand of cottonwoods and there is no water anywhere, I am really surprised. 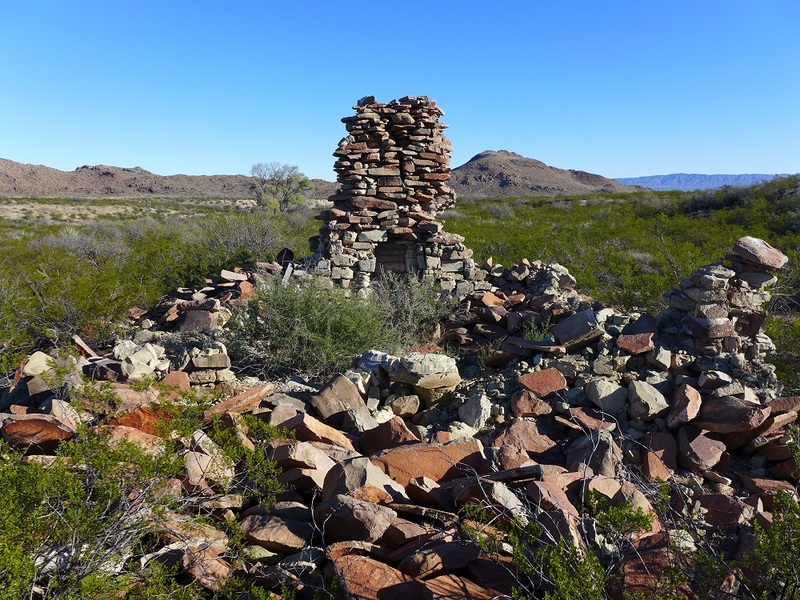 I move on up to the remains of the big stone house and it is quite something with the large stone fireplace. I spend a bit of time looking for both the gravesite and the old cavalry post ruins but can’t readily find them. 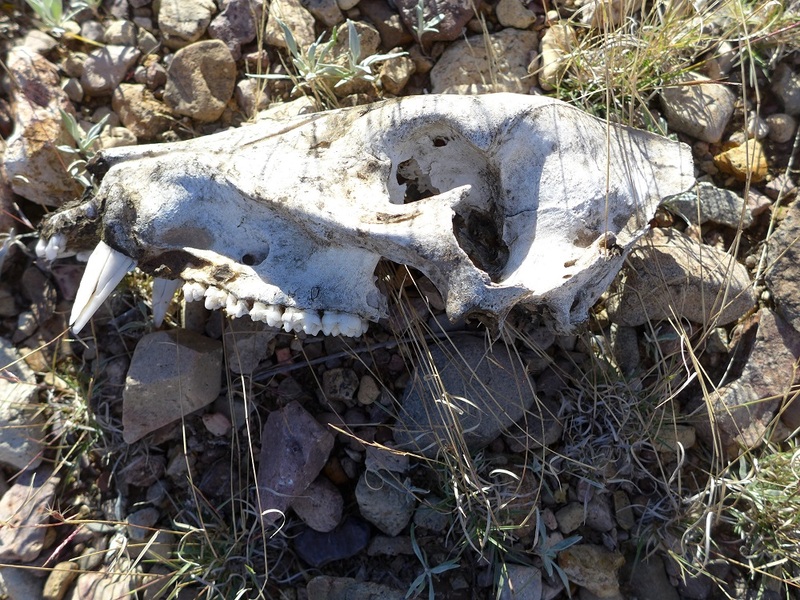 I do find this javelina skull though. 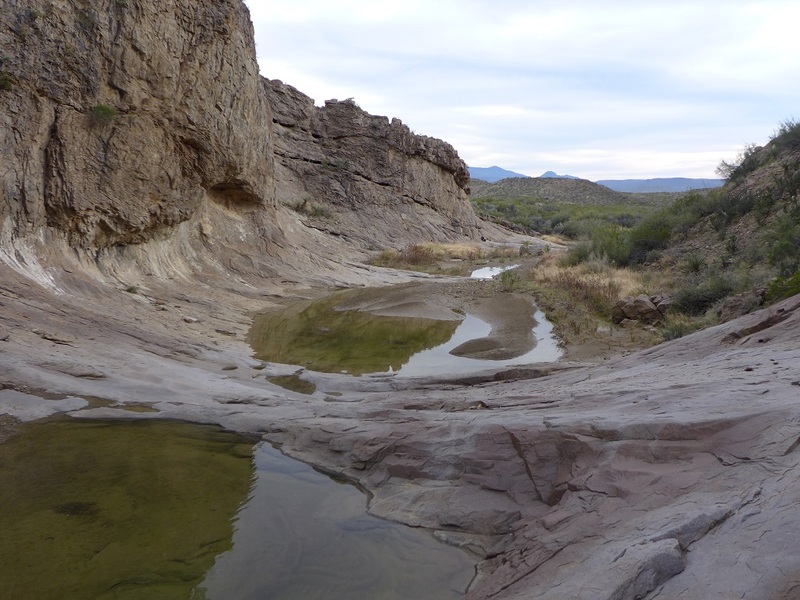 On east I come to a big wash overlook, this is the area that Hannold spring #1 should be, no sign of water. I walk down the bench and find remains of yet another old powerline and some ranch fencing. Dropping into the wash I follow it down. 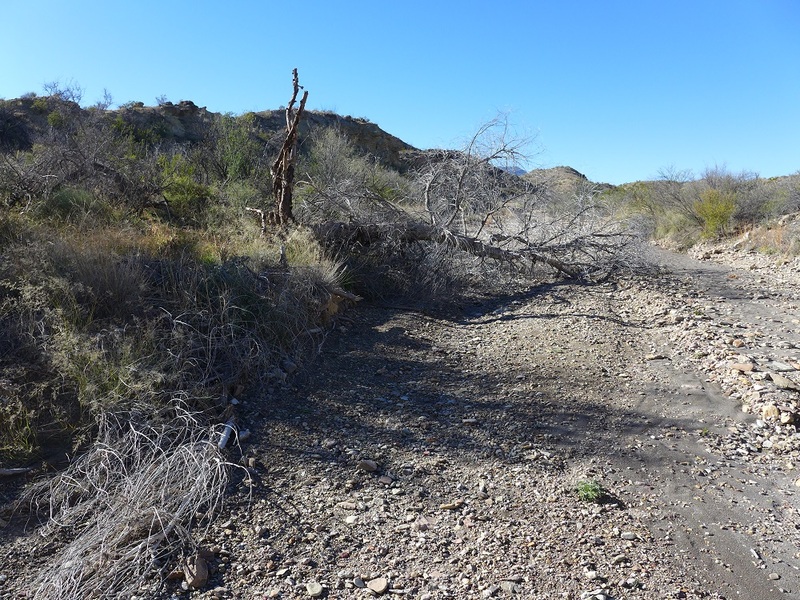 I come across this large but dead cottonwood in the vicinity of Hannold spring #2, again no sign of water. 11:00 after 4 miles I am at the confluence of the wash from Grapevine Hills, right up against the cockscomb of Hannold Hill, this is Avery Canyon. I love the blue of the clays. 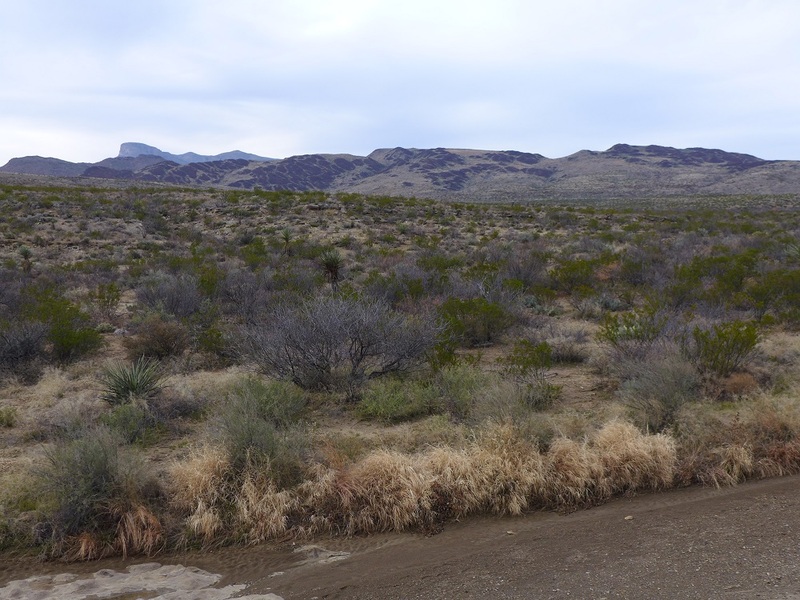 The terrain really starts to open up here and I am on a roll down the wide wash. Soon I see the hoodoos and know that I am getting close. 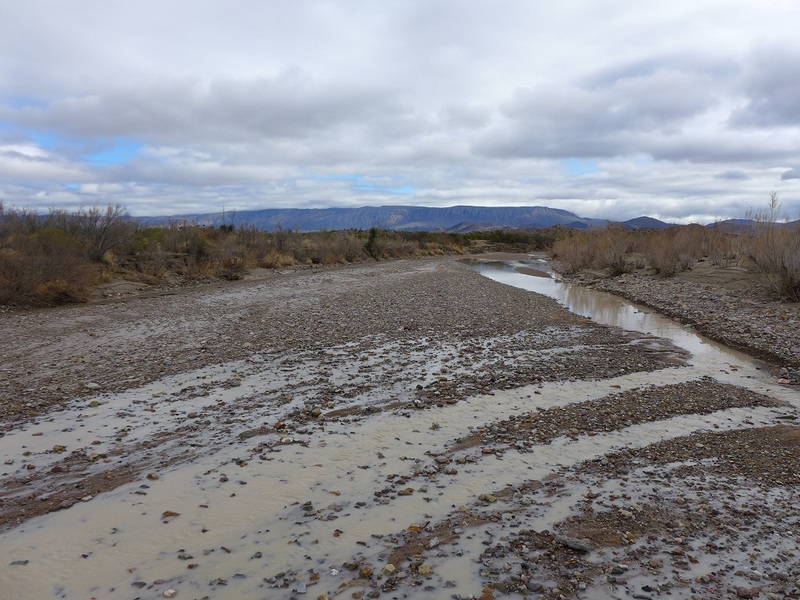 Avery wash joins Tornillo creek and it is completely dry. In a few minutes I am under the bridge where I had to carefully cross the stream seven days ago. 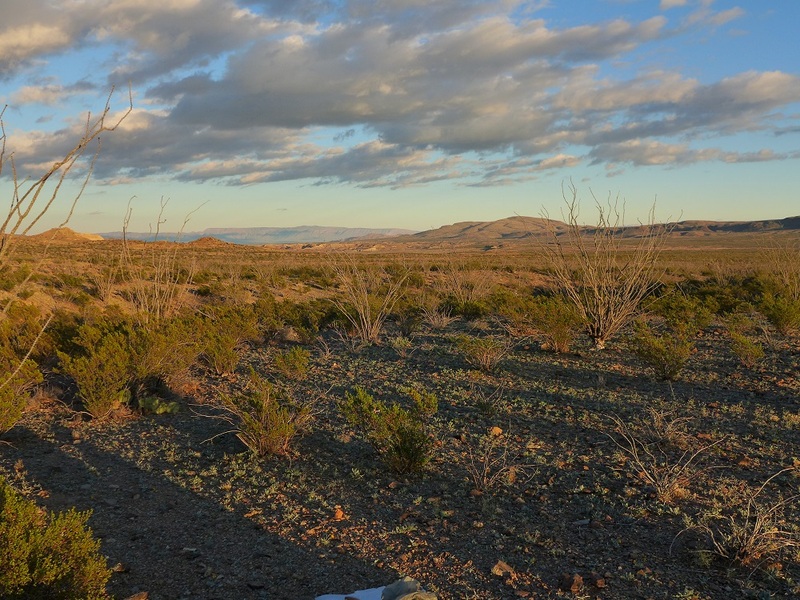 I climb out of Tornillo creek to the Fossil Bone exhibit and there is my lonely car. 12:30 after 8 miles and the trip is done! I change shirts and pull stuff out of the pack that I will need in the car and drive off to pick up my bear canisters on Paint Gap road. 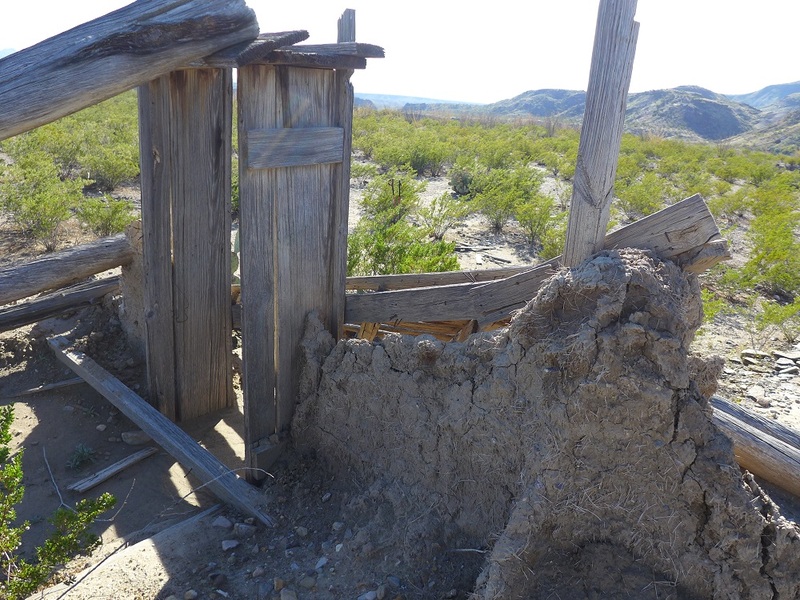 I get to the Chisos Mining Co. motel at 1:30 and they are kind enough to let me check in early. First I go over to DB’s BBQ to get lunch which I take back to the room to enjoy with some Big Bend Brewing cervezas and then I take that first great shower. I do some repacking and organizing of my gear as I wait for my friend Kelly to arrive as he was just finishing a short loop too. He arrives about 4:00 and we immediately dive into the details of each other’s trips over beers. We pull ourselves away so he can shower and we head to the Starlight for dinner. 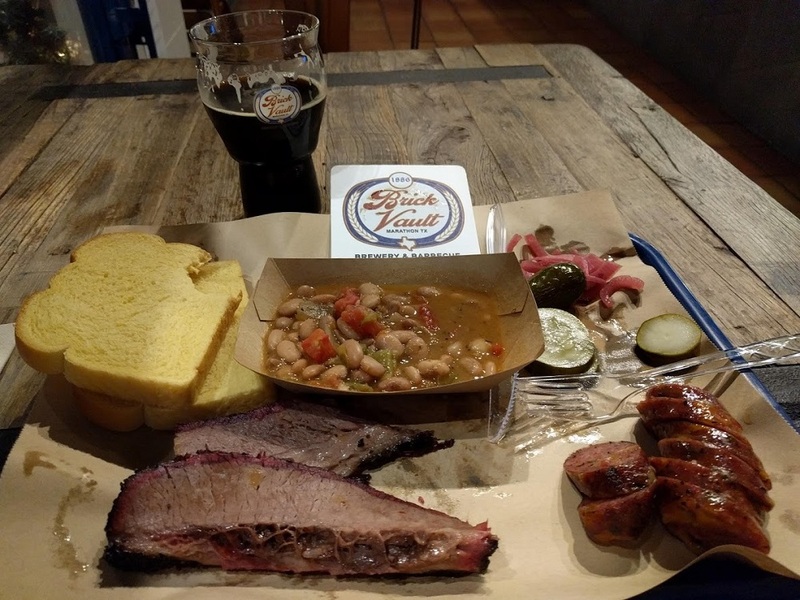 It was the best BBQ we had last year and I wanted to take it to the hotel with me to savor for my last Texas dinner. About an hour later I was checked in and enjoying a fine meal. I spent the evening repacking for the flight home tomorrow and reading material for an all-day meeting I would have the day after I got home, what a horrible way to end a great trip. 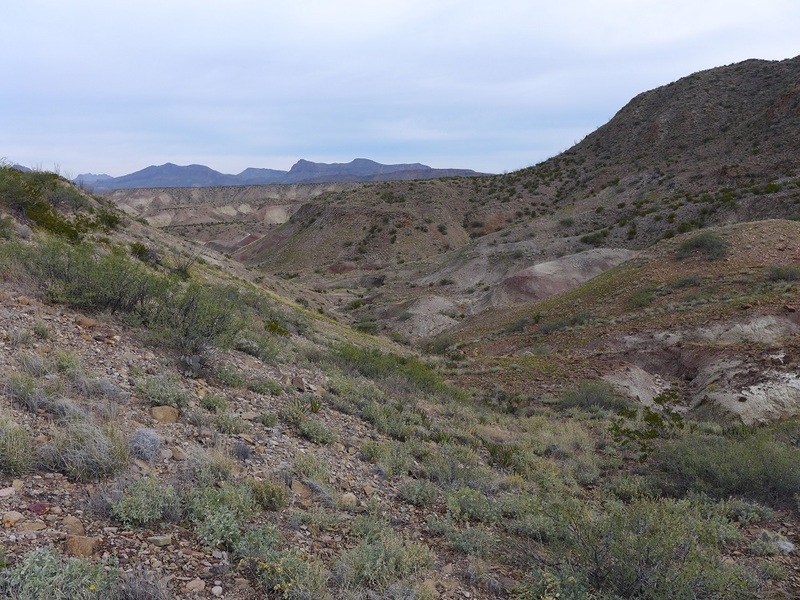 This is a great loop with lots of different things to see and kinds of terrain to walk through. There are also many side trips and other areas to check out, I just didn’t have time. One could easily go the whole trip and not see another soul but the one drawback is on the south side you will hear some traffic from the park road but you can camp where you will not see the lights. I did not hear traffic the last night even though the road was just over Hannold Hill. The water cache is critical to a successful loop and easy to drop. The food cache was not necessarily needed but did make the pack lighter the first few days. Like most of my off trail walks one needs to be confident of their route finding and map reading skills even though this area is more wide open and thus easier to see where you are going. 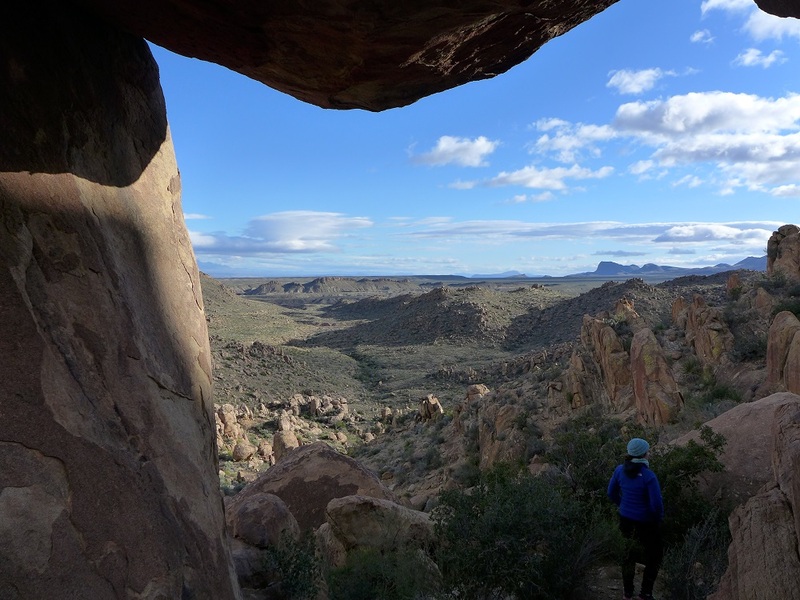 This entry was posted in Big Bend and tagged balanced rock, big bend, croton peak, grapevine hills, paint gap hills, rough run, slickrock canyon, slickrock mountain, tornillo creek. Bookmark the permalink. What a gift from an ol’ geezer still finding his groove on the unbeaten trails! Totally enjoyed this entry – thanks! Thanks all, it was a really enjoyable walk. My first visit to your blog (connected from a LinkedIn post). I will definitely be back! I can’t adventure like I used to so I truly appreciate your great writing and photos…armchair adventuring is the next best thing. Thank you. Thanks Anita and welcome to my adventures!